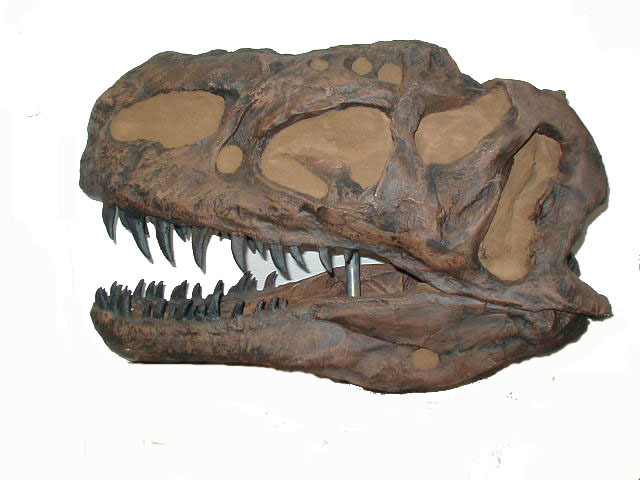 We provide excellent Dinosaur fossils and dinosaur cast replicas to museums, universities and collectors. We ship anywhere in the world and accept checks, money orders, credit cards, paypal and purchase orders. Payment plans and escrow are also available on some items. All items are cast in the best resins available. Colors may vary. If we don't have it we will find it for you (often for less than our competitors)! 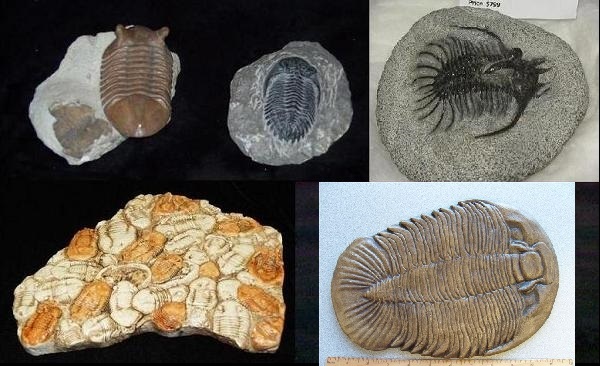 We can find real fossils or replicas and get you the lowest price anywhere. Do you have something you'd like to sell? We can help by listing it here at no cost to you. If you have questions or would like to be added to our mailing list, please Email us. All Fossils are listed alphabetically. 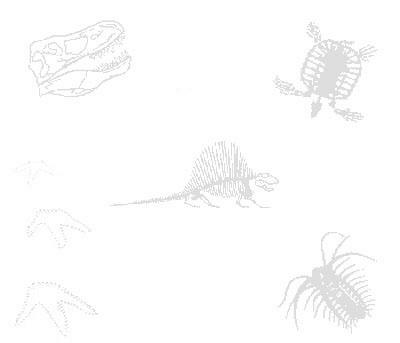 To Jump to a Fossil, click on the corresponding letter below. 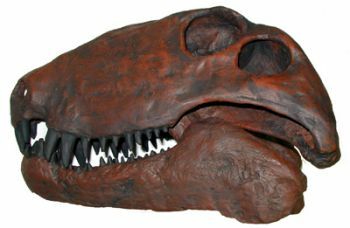 For example, Click on the "M" for "Mammoth"
This is the best replica skull available, from the rare and elusive Acrocanthosaurus, a meat-eating dinosaur from the Early Cretaceous. 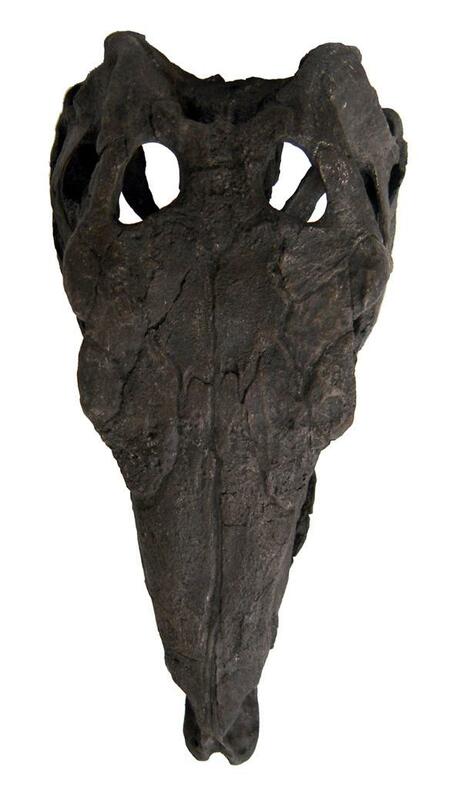 This replica is cast from the most complete skull ever found for this genus and species. 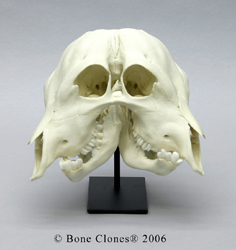 The original skull is so complete that it has been described, to represent the entire genus and species. 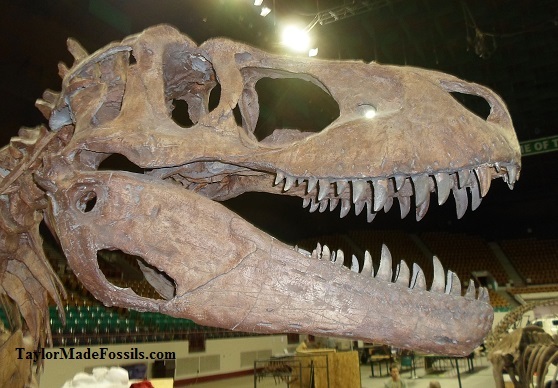 The skull is almost as long as Tyrannosaurus rex, yet much narrower. It appears to be very similar to, and almost as long as, Carcharodontosaurus from North Africa, and Gigantosaurus from Argentina. Easily transported to off-site locations for outreach programs, promotional opportunities, etc. 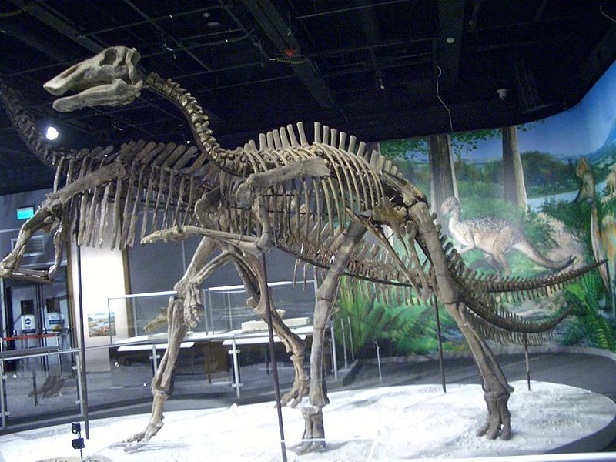 The original skeleton was prepared by Black Hills Institute and is now on display at the North Carolina Museum of Natural Sciences in Raleigh, NC, USA. Notes Some geographic restrictions may apply. May take up to three months for delivery. Check with us to see if an earlier delivery is possible. Size ~ 56.5" l (144 cm) Extras Crate and packing fees apply. Please contact us for details. Lease Info This item is leasable at 10% of listed price per month. See our rental page DinosaurRentals.com for more details. 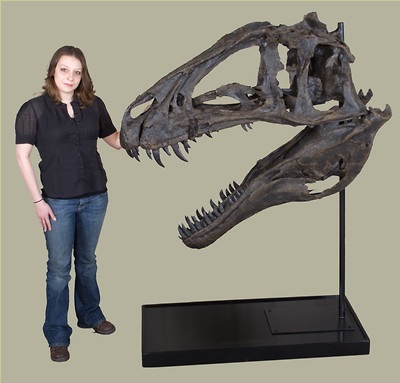 Acrocanthosaurus skeleton cast replica $120,000.00 (plus crating and shipping). Please call (314) 556-0650 or email us for more pictures or information. This is a replica cast from the only complete arm from an Acrocanthosaurus. Displayed in a "grabbing pose", all of the muscle and tendon attachments are evident. Can be mounted on an optional steel base. Exhibit alone or with a group of other dinosaur arms. Shipping and crating cost not included. 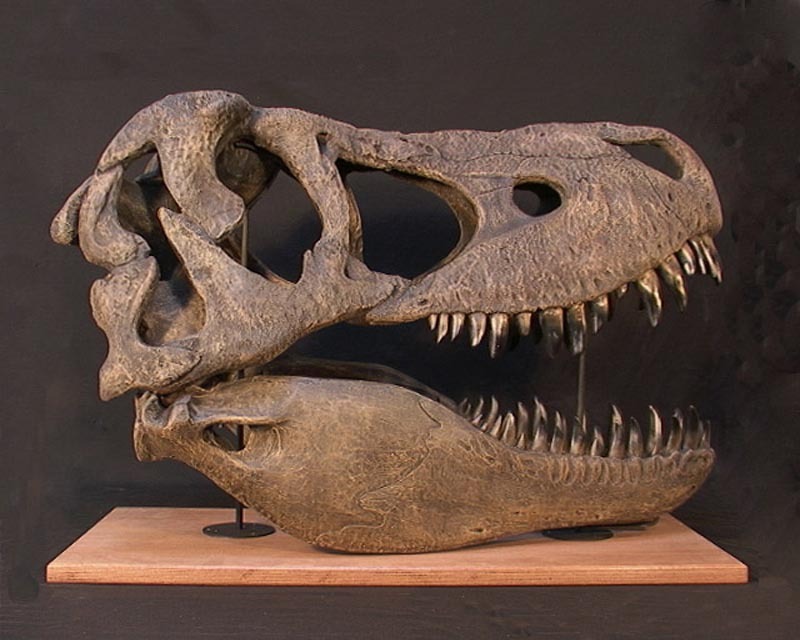 Albertosaurus sarcophagus skull and skeleton cast replicas. This beautiful specimen was molded from fossils discovered in the Two Medicine Formation, Teton County, MT, US. The originals are now in the Museum of World Treasures, Wichita, KS, US. The Skeleton cast measures: 20' long and 7.5' w (at the hips) or 6 m x 2.5 m at the hips. 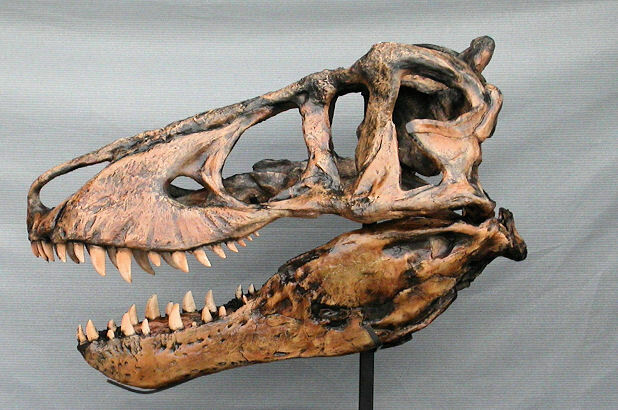 The Skull cast measures 32" x 18" x 12"
and Albertosaurus skeleton cast ($55,000 assembled / $35,000 unassembled kit) also available. From the dinosaur of Cretaceous Alberta, Canada. Royal Ontario Museum skeleton specimen. 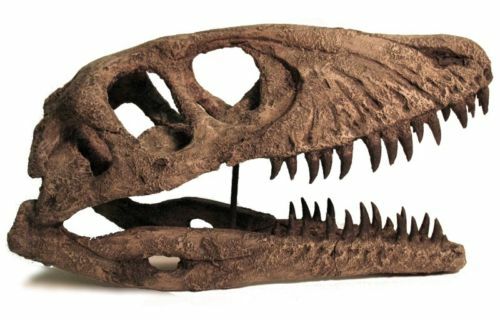 This Allosaurus skull cast was molded from one of the first and most complete fossil skulls of this fearsome predator. 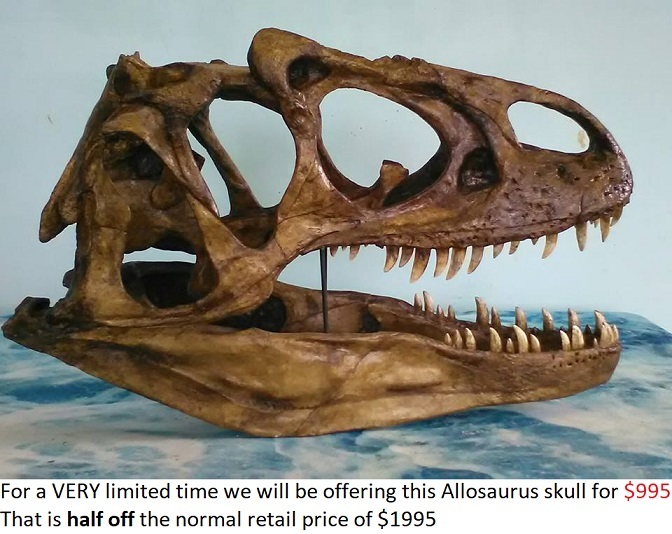 Allosaurus skull cast: $995 (plus $200 crating and freight shipping). Additional shipping charge will apply for residential areas. For shipping cost outside US please contact us. The crate size is 44 x 22 x 28 high and the weight is 75 lbs. Contact us for shipping quote. Please call (314) 556-0650 or email us for more photos or information. 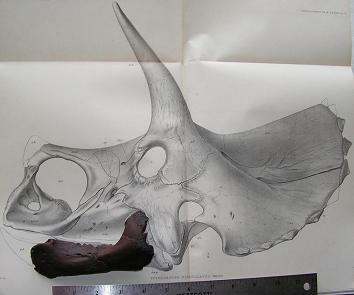 This specimen is from a full grown adult, and it measures 35L"x14W"x18H". It is cast in resin which yields extremely realistic texture. Customer reviews: "The detail on the teeth is just fantastic!" "It is wonderful! The color, texture, detailing are even better than your catalogue photographs. Thank you for your good business and integrity. You've have made me a customer for life"
"Thank you for a fine specimen!" 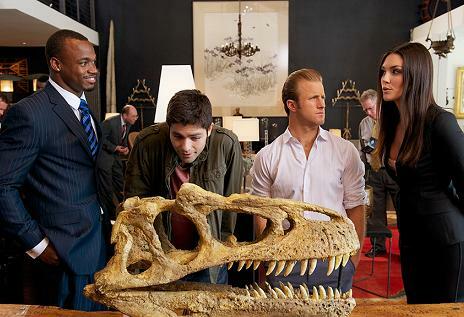 Our allosaurus skull was featured in a recent episode of HBO's "Entourage"
Allosaurus skull #2 resin cast: $1,950 plus shipping. UPS Shipping will be $175 within the U.S. We will gladly ship it anywhere in the world (shipping cost worldwide is based on weight and size. Shipping weight approx. 45 lbs). This skull takes approx. 7-10 days to prepare. A perfect last minute gift! A beautiful skull at a beautiful price! This cast replica of a juvenile Allosaurus jimmadseni measures 20.5 inches (52 cm) long, 8 inches (20.3 cm) wide, and 10.5 inches (20.6 cm) high. 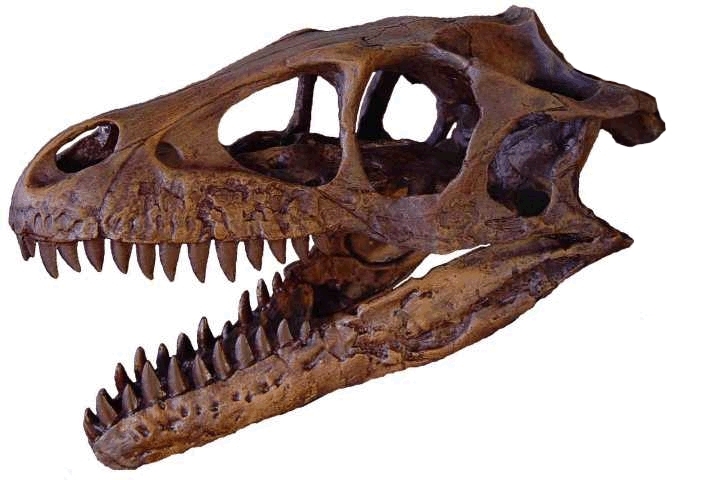 This is a juvenile allosaurus skull. 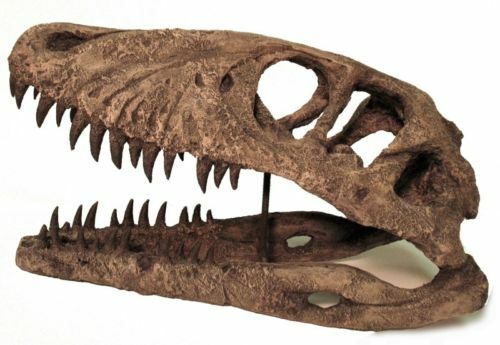 Juvenile Allosaurus skull cast replica. 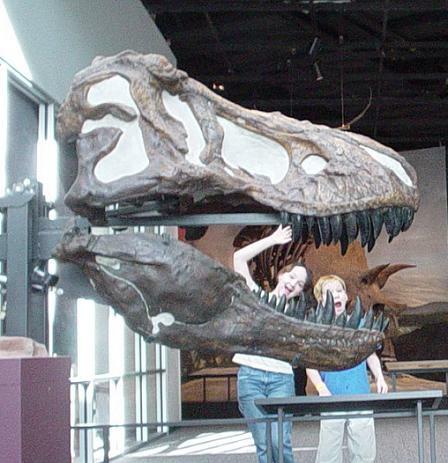 Shown here in front of the adult skull. This skull cast replica has all the terror packed into a slightly smaller size. 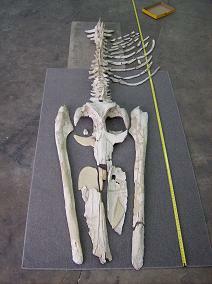 Skeleton measures 50 inches tall at the hip and 10ft long. 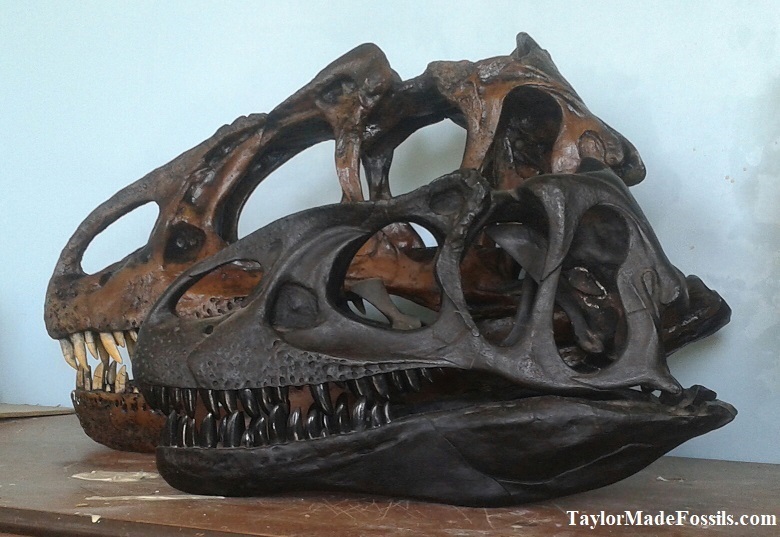 We also have 2 other Allosaurus skeletons (juvenile and adult). Please email us for prices and pictures. 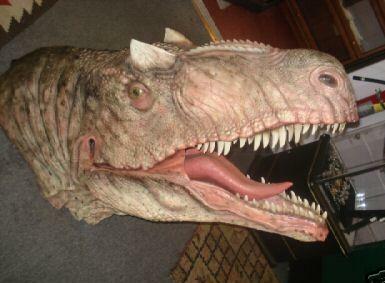 Here is a beautiful sculpted bust of the allosaurus known as "Big Al Two". It is wall mounted (floor mount and stand also available for additional $100 ). Measures approx. 48 inches long x 32 in high (123cmx82cm) without base. It is made of foam-filled fiberglass. Alxasaurus (pronounced AWL-shah-SAWR-us) which means "Alxa Desert lizard" is a genus of therizinosauroid theropod dinosaur. 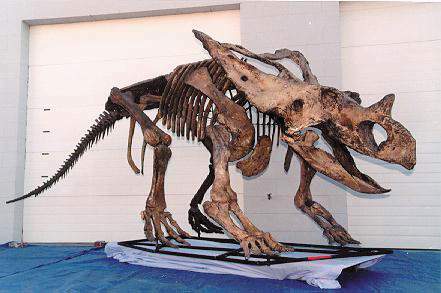 From the Early Cretaceous of Inner Mongolia. It is one of the earliest known members of the superfamily Therizinosauroidea, but it still possessed the body shape - including the long neck, short tail, and long hand claws - of later therizinosauroids. 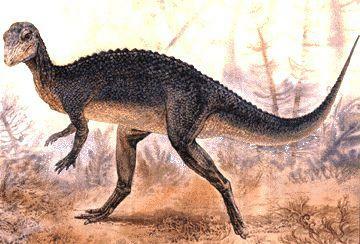 Like other members of this group, it was a bipedal herbivore with a large gut to process plant material. Several specimens are known and the largest was a little over 12 feet (3.8 m) long. You can purchase all or part of any skeleton. 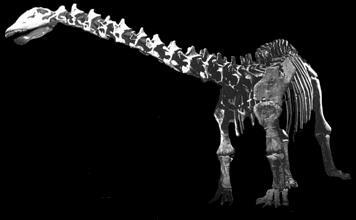 Full size adult Apatosaurus excelsus Skeleton cast replica. The finest you will find. This beautiful skeleton measures 80ft long and 15' 6" high at the hip. Custom mounting and poses available. Please email us or call (314) 556-0650 for more details. Click HERE for an additional photo. 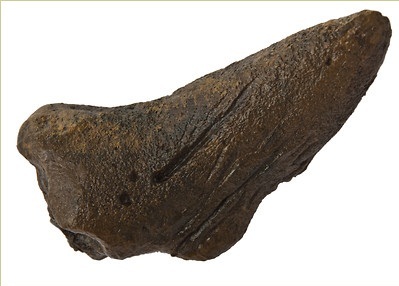 This apatosaurus femur measures 67" long. The original is housed at BYU in the United States. Resin cast $690 plus crating and shipping. Shipping cost can not be calculated in shipping cart and is not included. There is also an optional stand. This item will need to be crated ($100) for shipping. This cast is also available for pickup in St. Louis. Crate measures: 86 x 92 x 22in. Total shipping weight (with crate and stand) 110 lbs. For our full line of Sauropod dinosaur casts click here. 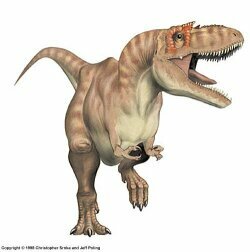 Appalachiosaurus ("Appalachian lizard"), a T.rex relative, is a genus of tyrannosauroid theropod dinosaur from the Late Cretaceous of eastern North America. Like almost all theropods, it was a bipedal predator. 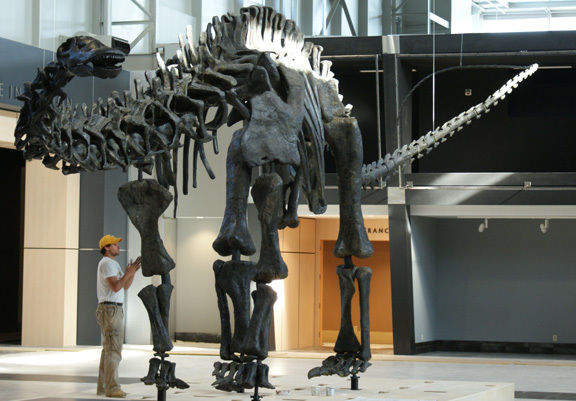 The skeleton measures 21 feet long and 8 feet high at the hips. Total skeleton height varies based on position. Shipping and crating is not included. For estimate please call (314) 556-0650 or email us for more pictures or information. Arstanosaurus is from the Late Cretaceous (Santonian), Bayn Shireh Formation. 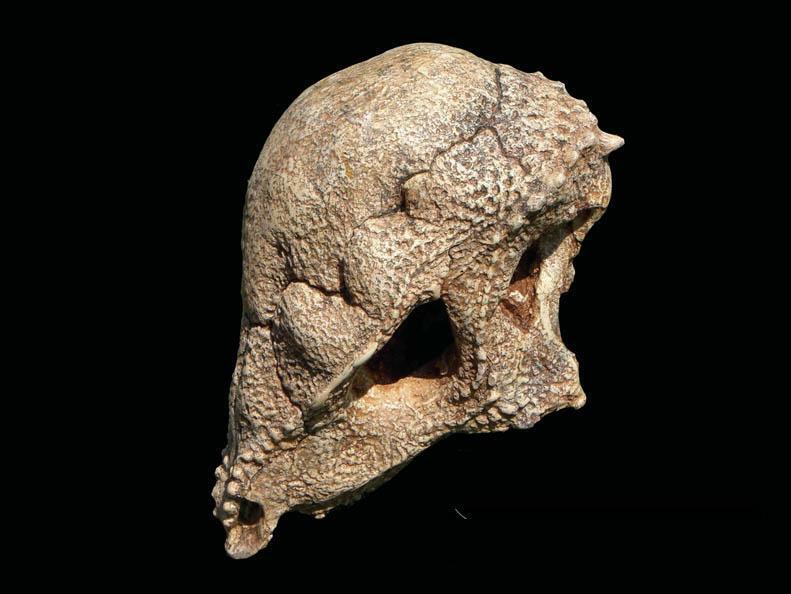 This skull measures 5.51 inches (140 mm). 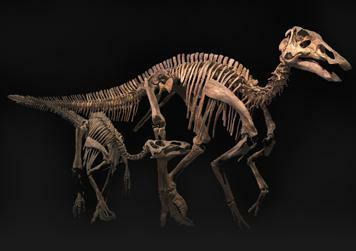 Studies of the microstructure of the bones suggest that the young grew rapidly attaining a height of 40-50 centimetres in the first year after hatching. 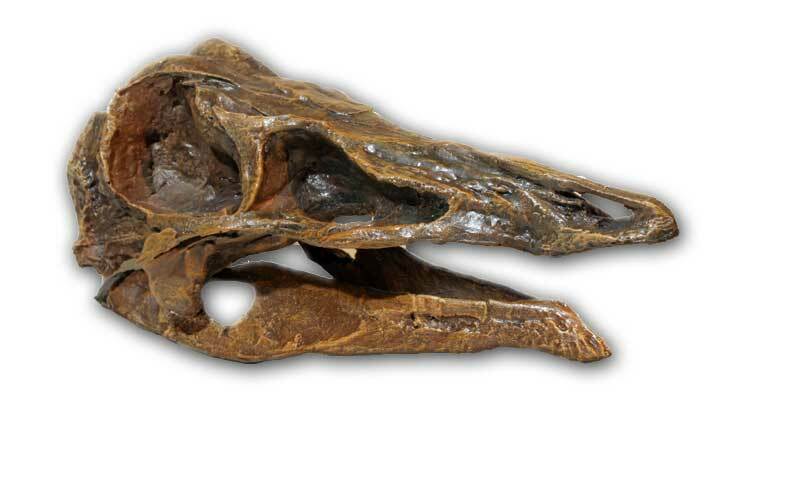 This skull is that of a young hadrosaurid or duck-billed dinosaur, possibly aged 3-4 years. Adults were probably 6-7 metres high and up to 15 metres long. Avimimus, means 'Bird mimic'. It was interpreted by its discoverer, Dr Sergi Kurzanov, as a dinosaur that had features in parallel with birds, perhaps even feathers. The animal possibly had short, wide wings of limited use for flight and may even have been warm blooded. The foot of Avimimus is compared with that of the large carnivorous dinosaur, Tarbosaurus and the similarities are clear. The middle metatarsal bone is very reduced in both. Please call (314) 556-0650 or email us for more pictures, information or shipping estimate. Bactrosaurus johnsoni Skeleton cast #2. This is a juvenile specimen measuring: 7ft l x 3ft h (2.13m l x .9m h). Discovered in Mongolia, China. Late Cretaceous, Mongolia, China. Bactrosaurus johnsoni was an unusually small, herbivorous dinosaur. They may have lived in small groups for protection, and near dense vegetation to avoid being detected by hunting carnivores. This important hadrosaur maintains many primitive skeletal features. It is classified near the lambeosaurinae group despite its lack of a cranial crest. 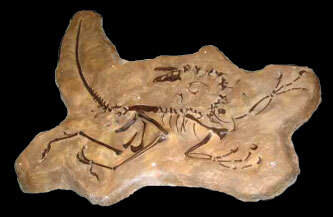 This skeleton is accurately reconstructed, cast in solid urethane, and finished to look like the original fossil. This example is mounted in a walking position however, it can be ordered in various poses to reproduce a small herd. This specimen of Bagaceratops rozhdestvenskyi is one of the smallest skulls known of a dinosaur. The large orbits suggest it was a juvenile. Related to Protoceratops andrewsi, this protoceratopsian was somewhat smaller, the skulls of the adults never exceeding 25 cm (9.8 in) in size. A bony knob on the face, a precursor for the well-developed horns of the larger ceratopsians, was more prominent than that in Protoceratops andrewsi, but the frill was less elaborately developed. So, in one feature Bagaceratops rozhdestvenskyi was more advanced than Protoceratops andrewsi but in others, more primitive. It possessed a mixture of advanced and primitive characteristics. As with other neoceratopsians, Bagaceratops had a sharp beak at the front of the jaws and a row of leaf shaped teeth behind. Below each tooth that erupted along the edge of the jaw was a waiting line of unworn teeth under the 'gums' so that these little dinosaurs were able to feed on very tough vegetation without wearing out their tooth supply. 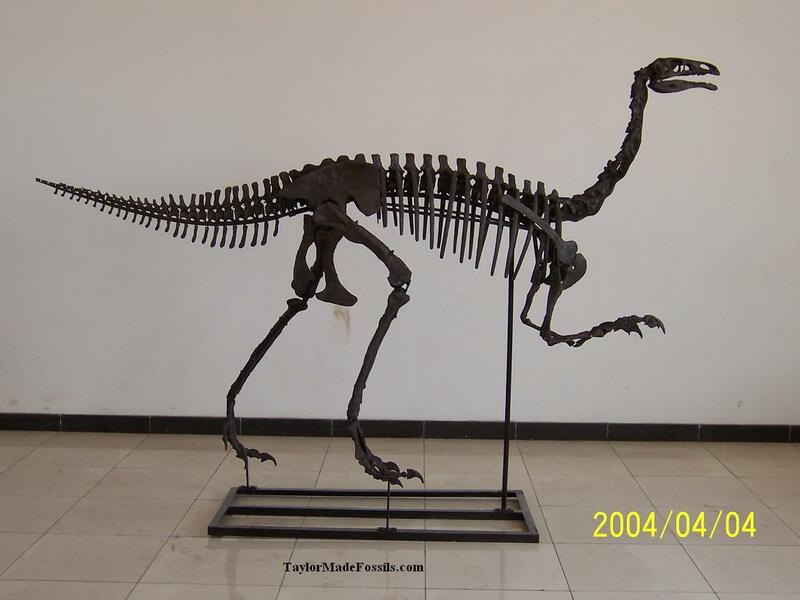 Bambiraptor feinbergi skeleton cast replica. This cast is a plaque mount showing how the fossils were oriented when discovered. A great stand alone display. Molded from original fossils discovered in the Two Medicine Formation, Montana, US. 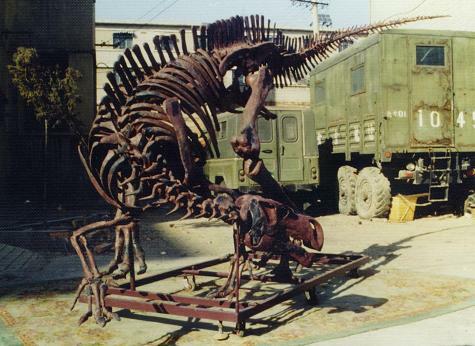 Bellusaurus sui skeleton cast replica. Scientific name: Bothriolepis panderi. This specimen was discovered in Morocco. Bothriolepis Armored Fish cast replica. 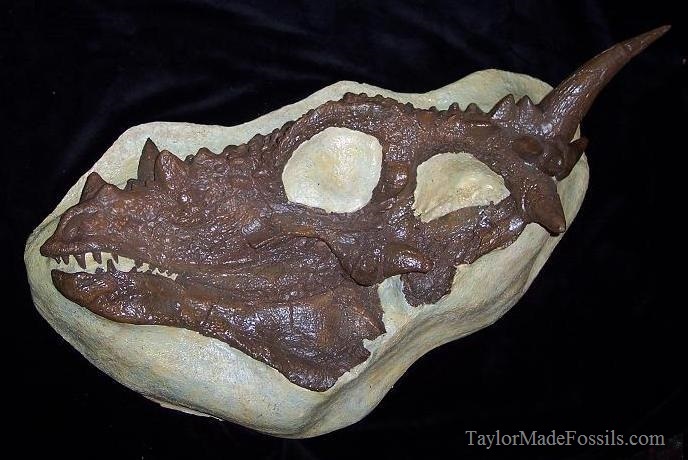 Brachyceratops skull cast replica please inquire. 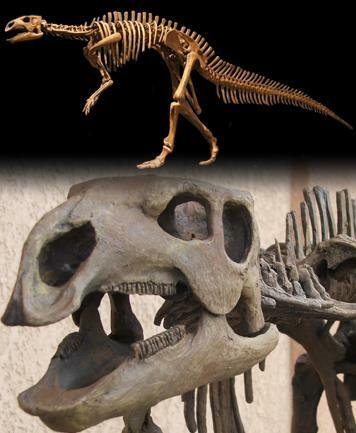 Brachyceratops skeleton cast replica please inquire. 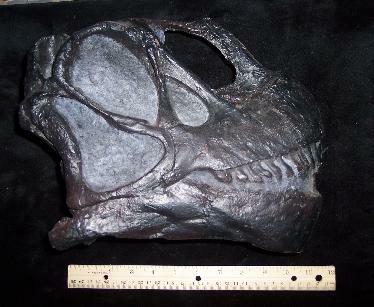 Brachylophosaurus skull cast please inquire. Brontotheriidae, also called Titanotheriidae, is a family of extinct mammals belonging to the order Perissodactyla, the order that includes horses, rhinoceroses, and tapirs. Superficially they looked rather like rhinos, although they were not true rhinos and are probably most closely related to horses. They lived until the very close of the Eocene. 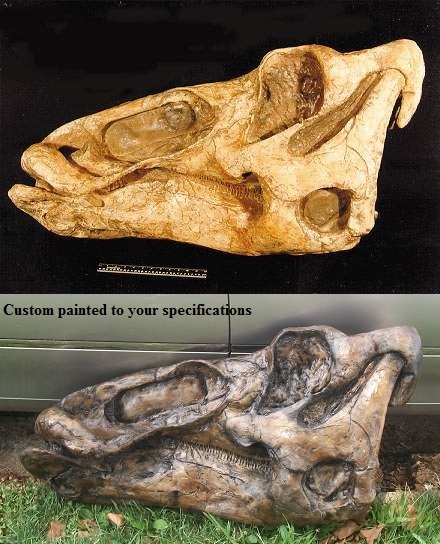 Dimensions of the fossil skull replica: 26" long x 13" wide x 24" tall. The skull and lowers are from Custer County, SD. 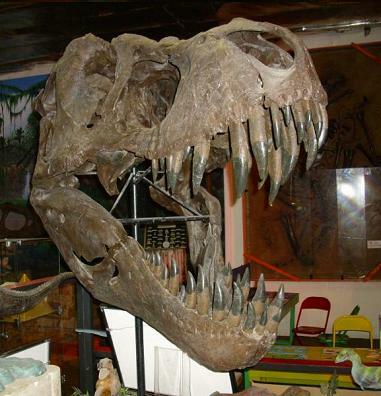 The skull (upper) was collected on a cattle ranch in 1992 and the lowers found in the same area but, later in 1999. Brontotheres have teeth adapted to shearing (cutting) relatively nonabrasive vegetation. Their molars have a characteristic W-shaped ectoloph (outer shearing blade). The history of this group is well known, due to an excellent fossil record in North America. The earliest brontotheres, such as Eotitanops, were rather small, no more than a meter in height, and were hornless. 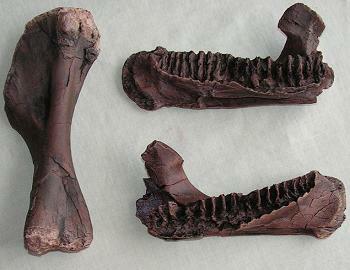 Brontotheres had massive body sizes, although some small species, such as Nanotitanops did persist through the Eocene. Some genera, such as Dolichorhinus, evolved highly elongated skulls. Later brontotheres were massive in size, up to 2.5 m (8.2 feet) in height with bizarre hornlike skull appendages. For instance the North American brontothere Megacerops had large sexually dimorphic paired horns above their noses. The sexually dimorphic horns suggest that brontotheres were highly gregarious (social) and males may have performed some sort of head clashing behavior in competition for mates. 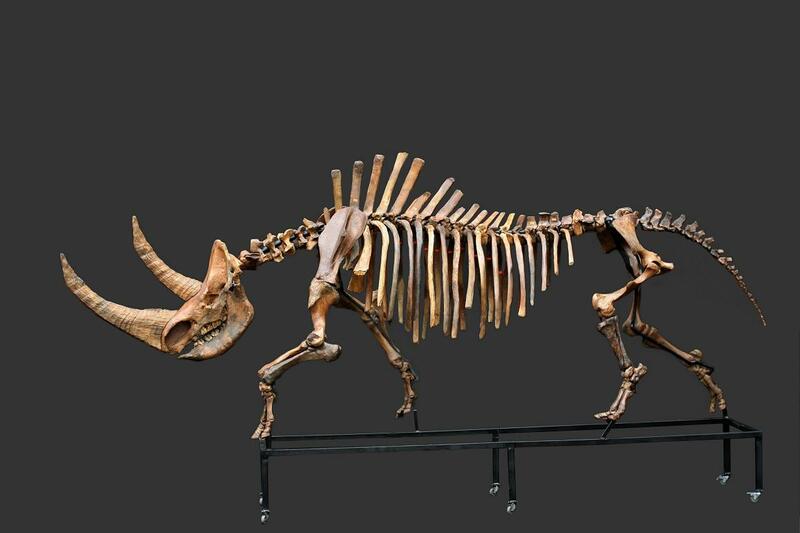 However, unlike rhinos, the horns of brontotheres are composed of bone, the frontal bone and nasal bone, and were placed side-to-side rather than front-to-back. 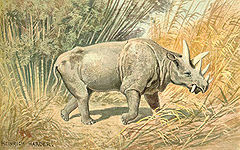 Brontotheres probably became extinct due to an inability to adapt to drier conditions and tougher vegetation (such as grasses) that spread during the Oligocene. Two heads, fused, but one endocranium and one foramen magnum that connected to a single neck and body. A very rare and beautiful specimen considering that the skulls are literally mirror images of one another. It appears to have been artistically created but really was molded and cast from a real skull. Custom Stand included. 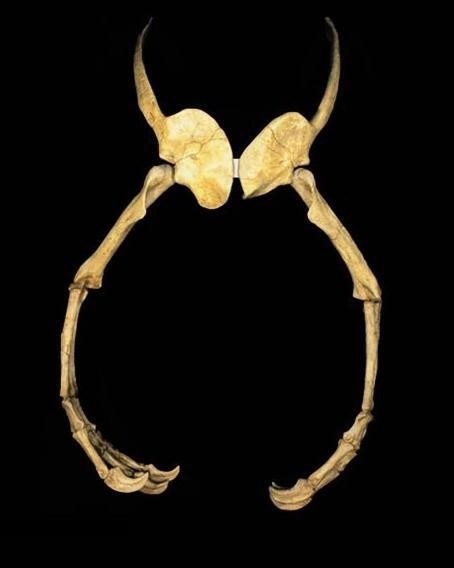 This calf exhibits the rarest form of conjoined twinning known as Diprosopic Parapagus. This bizarre congenital defect results from the complete fusion of the bodies, limbs, necks and rear portions of the skulls of identical twins, with only their "faces" remaining to reveal their individual origins. We had to show the underside of this unique specimen. 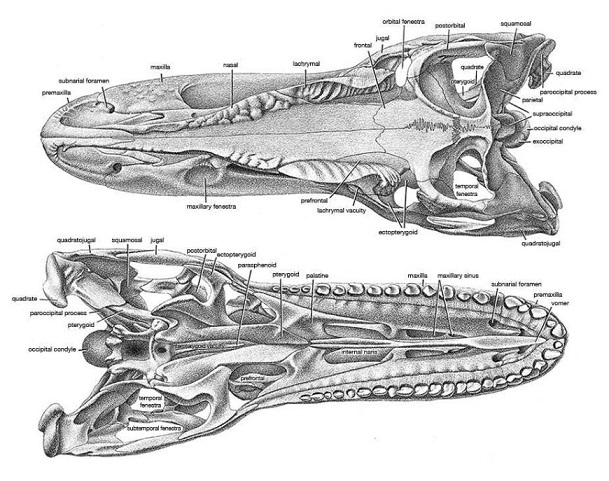 Both mandibles were cast separately and attached to the skull in the correct anatomical position to match the original skull. 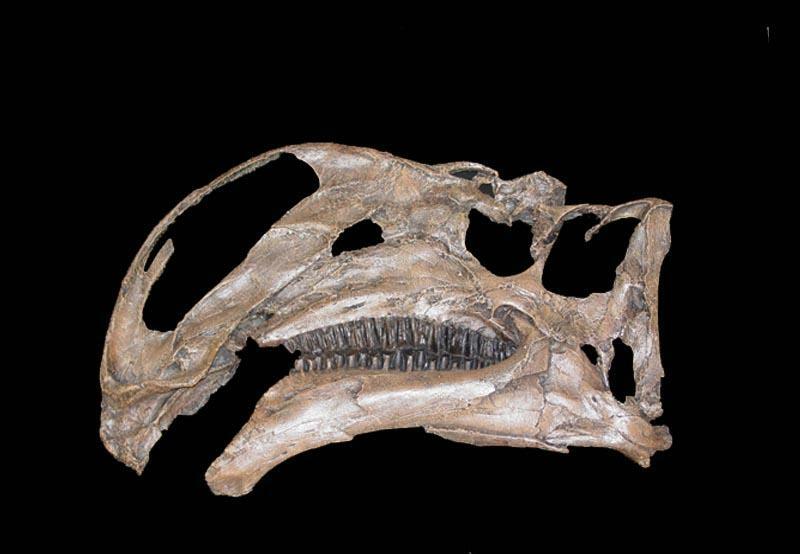 This full size adult skull was molded from the finest known Camarasaurus skull. 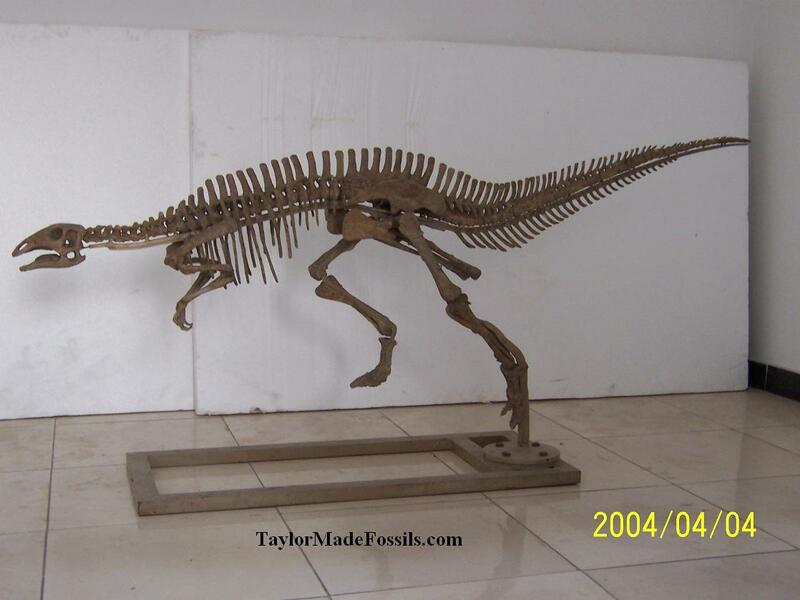 For our full line of Sauropod dinosaur casts click here. 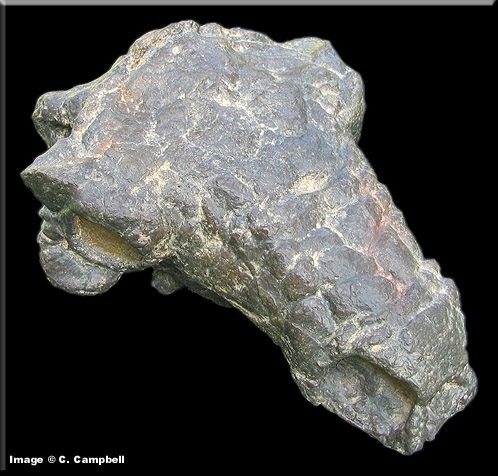 Full size Camarasaurus lentus Juvenile skull cast replica. Size 13" x 6" wide x 9" tall. Camarasaurus (pronounced KAM-ah-rah-SAWR-us) and (meaning "chamber vertebra") was a large, long-necked plant-eating dinosaur that lived during the late Jurassic period. This sauropod was about 60 ft long and weighed roughly 30 tons. 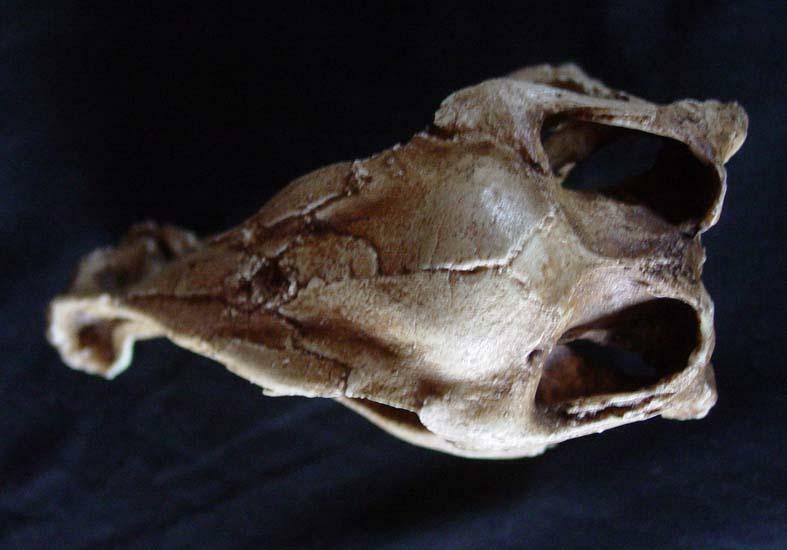 This is a cast of the skull of a juvenile perhaps half grown. 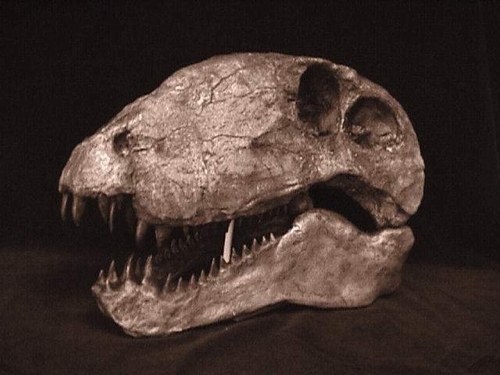 The original skull was found in Utah. 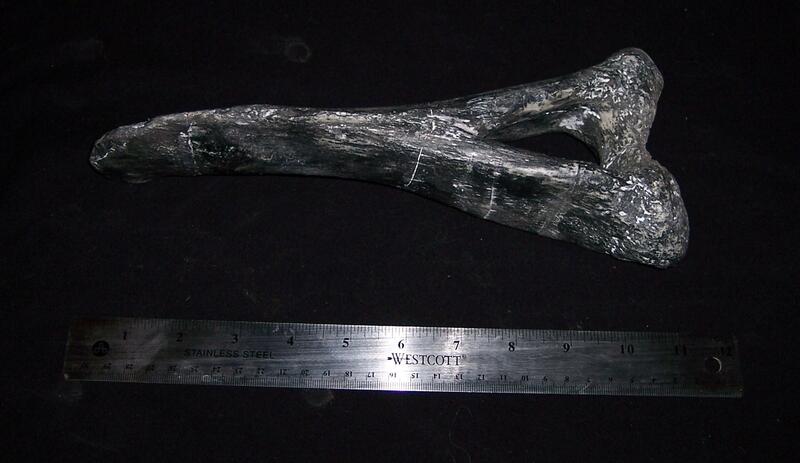 Camarasaurus femur (thigh bone; right side; fiberglass); Jurassic; $800 femur measures 58" long. The head of the femur is 16" wide. Camptosaurus (pronounced KAMP-to-SAW-rəs) is a genus of plant-eating, beaked dinosaurs (Late Jurassic and Early Cretaceous). The name means "bent lizard", because, when standing on all fours, its body must have been arched (Greek kamptos meaning "bent" and sauros meaning "lizard"). CaveBearSkulls.com We have the largest selection of Cave Bear (Ursus spelaeus) fossils anywhere. 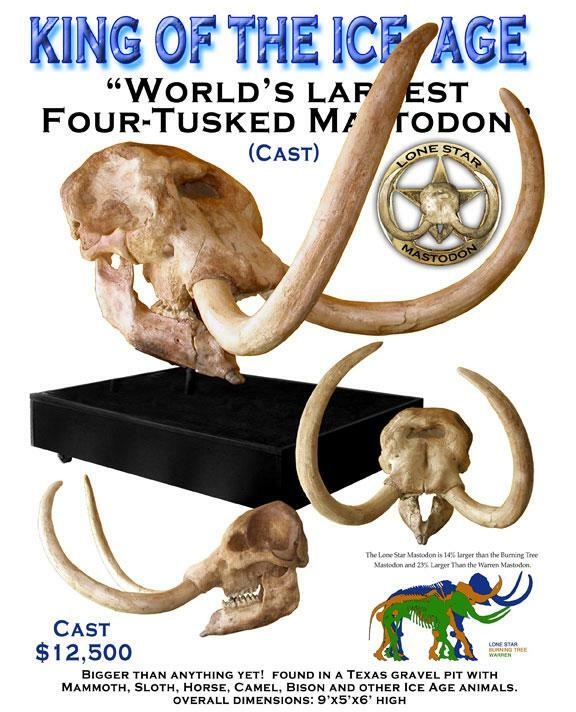 From Real Fossil Cave bear skulls and skeleton fossils to museum quality cast replicas. 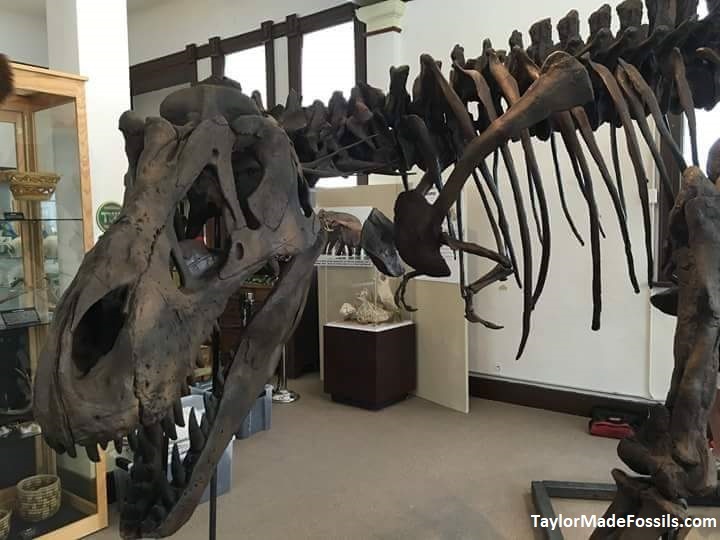 Straight from the Jurassic, this skeleton measures 15 feet long. Resin cast skeleton mounted, $39,000. Long-frilled ceratopsid herbivore dinosaur of Cretaceous Alberta (Canada). Chirostenotes (pronounced KIE-ro-Sten-o-teez, named from Greek 'narrow-handed') was an oviraptosaur from the late Cretaceous of Alberta, Canada. In life, the animal was about 9.5 feet long and 3 feet tall at the hips. 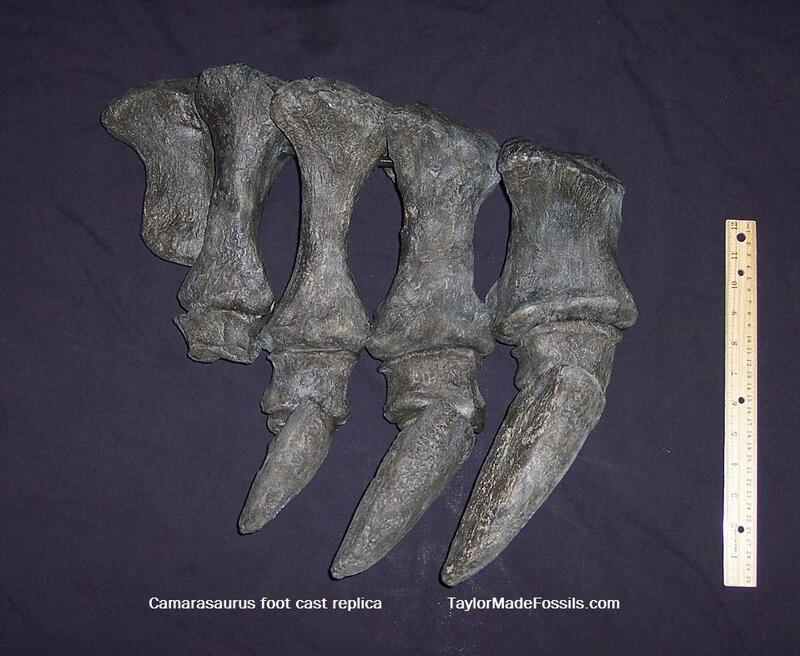 This is a cast of two Chirostenotes claws that were found together. The originals were collected in N.E. Montana's Hell Creek Formation. 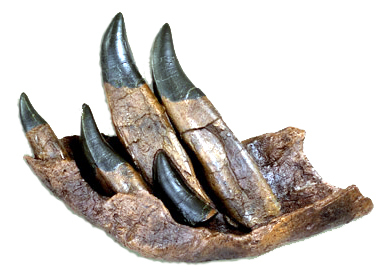 There was no restoration done to the fossils, both claws were near complete! 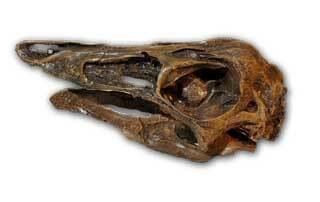 Also available: Deinocheirus skulls and skeletons casts replicas. For many years Therizinosaurus cheloniformis and Deinocheirus mirificus presented palaeontologists with a puzzle. 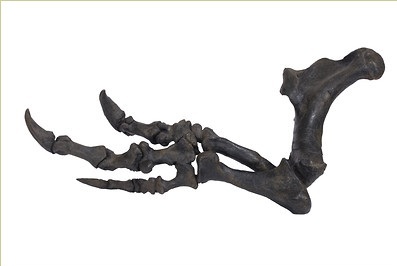 Evidently somehow related to the theropods or carnivorous dinosaurs, the function of their large claws and their attendant forelimbs was a mystery. Certainly, they had to belong to animals quite unlike Tarbosaurus bataar with its highly reduced forelimbs and yet they were animals clearly in the same size category. Material that has recently come to light in China suggests that these animals were as atypical of large carnivorous dinosaurs as pandas are atypical of bears. Like pandas, they were probably gentle herbivores. They used their large forelimbs and claws to pull down branches on which to browse. The claws with the horny sheath that would have fitted over the outside of the bone may have been up to one metre long. 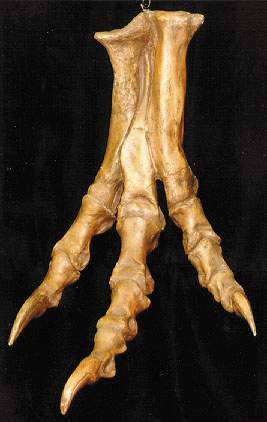 Some palaeontologists have even suggested that therizinosaurs may have used the huge claws for ripping into ant nests. The picture of Therizinosaurus cheloniformis and Deinocheirus mirificus as browsers in a forest agrees well with the view that conditions in Central Asia had become much more moist than what they had been like years before. Age: Late Cretaceous (Late Campanian-Early Maastrichtian), Nemegt Formation. Meaning of Name: Therizinosaurus: Scythe reptile. 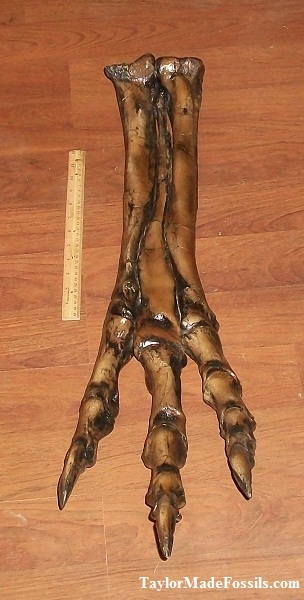 Deinocheirus: "Terrible hand"
Deinonychus skull cast replica #1. Molded from an original fossil skull: $2,800.00 (plus shipping). Please email us for photo and more information. Deinonychus (pronounced dye-NON-ik-us) (Greek "terrible" and "claw") was a genus of carnivorous dromaeosaurid dinosaur. 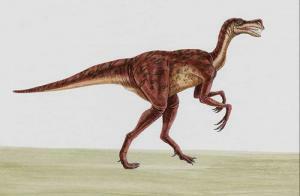 There is one described species, Deinonychus antirrhopus. 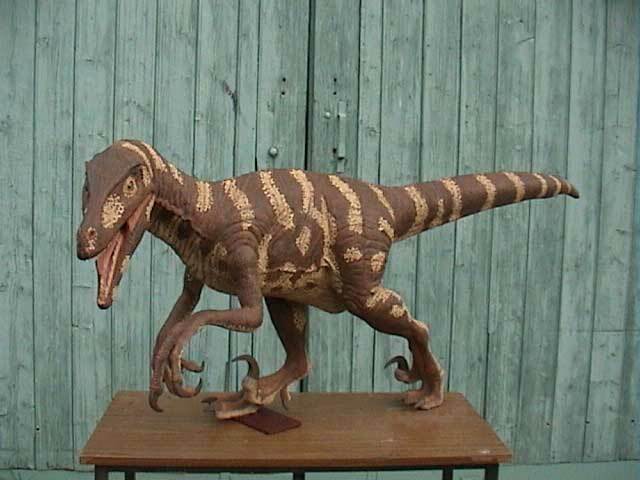 This rendering of a Deinonychus is made of resin and measures: 343mm (13.5") long. This skull measures 13 x 8 x 7.5 inches. Dimetrodon skull cast replica. This dimetrodon skull was molded from the original specimen at BYU. This skull measures 13 inches long x 8inches wide x 9 inches high. Beautiful example of this mammal-like reptile of Permian Texas. This skull measures 17 inches long x 9 inches wide x 11 inches high. To save on shipping the tail can be removed. Casts may vary in color and type of stand used. Dimetrodon, pronounced (die-MET-roh-don) which means ("two measures of teeth" so named because it had a large skull with two different types of teeth; shearing teeth and sharp canine teeth, unlike reptiles. Dentition showing this differentiation of teeth is called heterodonty). Dimetrodon has a large sail which was probably used to regulate body temperature; the surface area would allow it to warm up or cool off more efficiently. 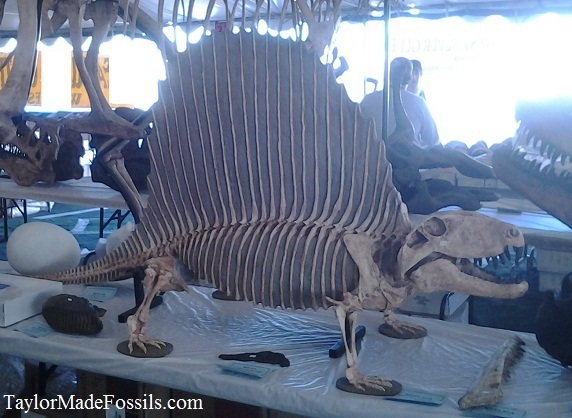 Dimetrodon was not a dinosaur but a pelycosaur, an early synapsid (mammal-like reptile). 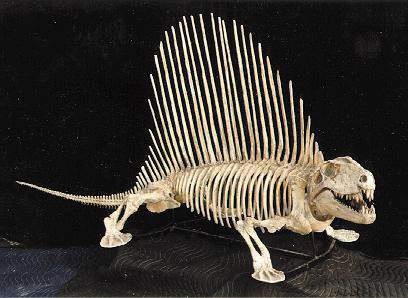 Dimetrodon Limbatus skeleton. This wonderful Dimetrodon skeleton is the BYU specimen. 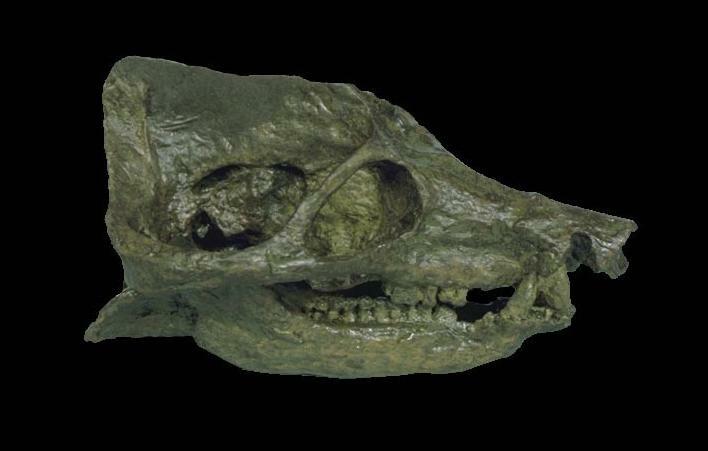 A carnivorous mammal-like reptile from the Permian. Discovered in Texas, USA. 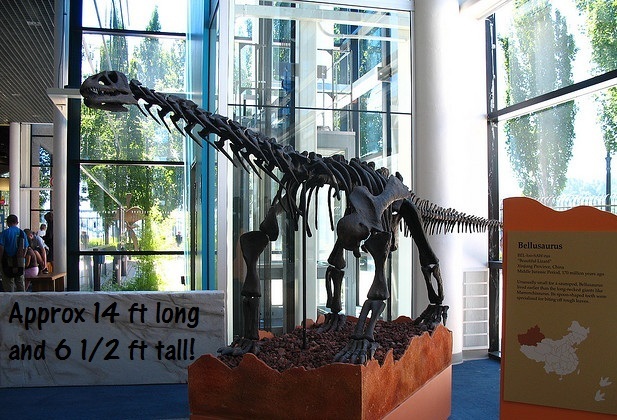 The skeleton measures 11ft long, and 4 ft high. 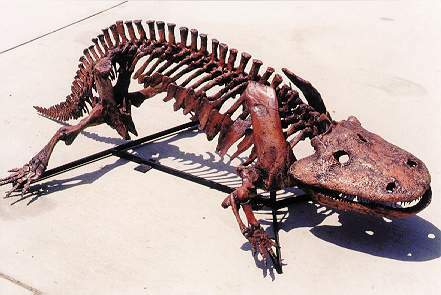 Dimetrodon Limbatus Hayashibara skeleton cast replica. It doesn't get any better than this. 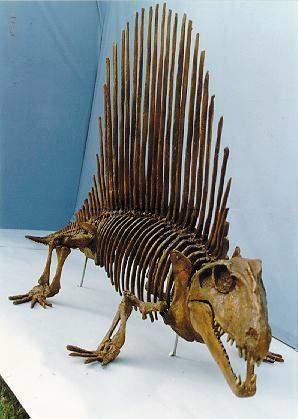 This cast replica Dimetrodon skeleton measures 11 feet long and 4 feet high. Assembled and crated. Mammal-like reptile of Permian Texas. Hayashibara Science Museum. Diplodocus was a late Jurassic sauropod with a long neck, elephant-like legs, and a long tail. 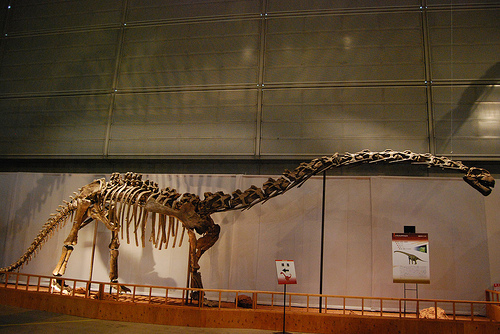 Diplodocus is named for the two pronged bones in the center of its long tail. The nostrils were at the top of the head. A member of the "peg shaped teeth" family of sauropods, the Titanosauridae. Would you like a Diplodocus or apatosaurus cast replica skeleton? Please inquire. Diplodocus Chevron: Chevrons are a series of bones on the underside of the tail of reptiles. This Diplodocus chevron measures 11 inches in length. This is truly a monster. 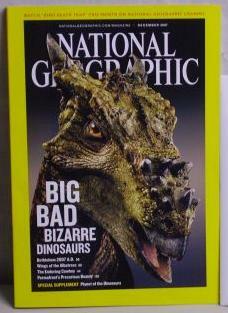 Recently featured on the cover of National Geographic December 2007 (BIG BAD DINOSAURS) Dracorex hogwartsia is a brand new dinosaur species. 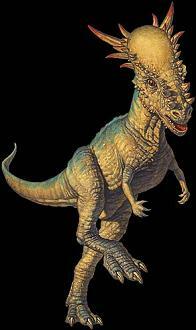 Type Species - Dracorex hogwartsia,From the late Cretaceous of North America.Etymology - from the Latin words: draco (meaning dragon) + rex (meaning king). translation: "dragon king"
Named after the fictional "Hogwarts Academy," from the Harry Potter series. 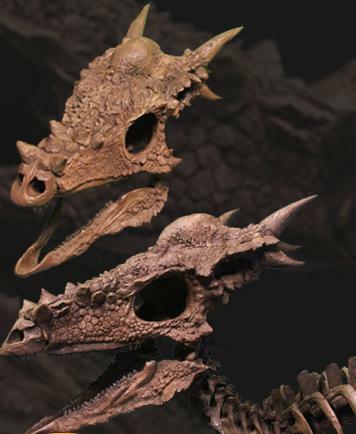 This is the first replica available for Dracorex hogwartsia! This profile contains the dentary and pre-dentary. The front teeth are serrated, looking as if this may be the first evidence of an omnivore! This replica is cast in solid resin and is made to hang on a wall or rest on a table. 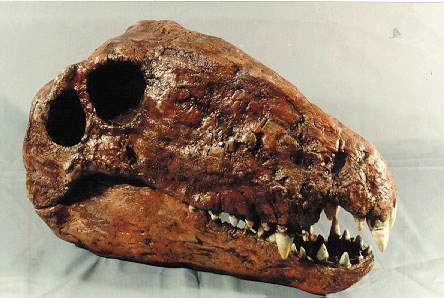 Restored Skull from the Left View, Entire tooth row! 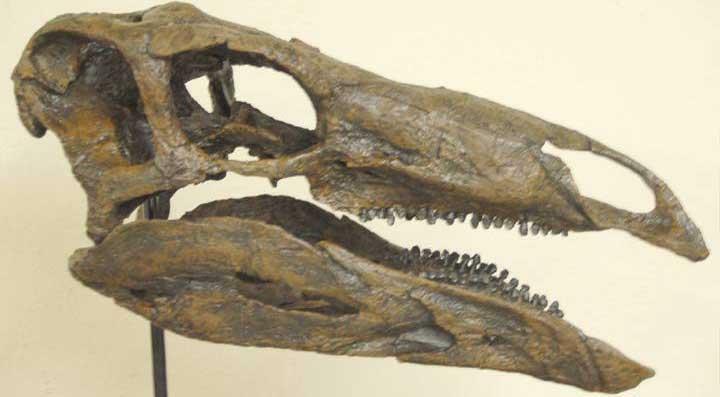 Skull measures 13 inches high and 20 inches long. Customer review: "It's wonderful, better looking than ANY known photograph can ever capture! Many thanks." 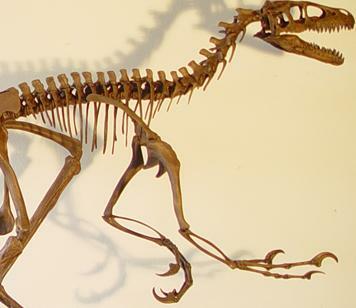 Please call (314) 556-0650 or email us for more pictures or information. .
Dromaeosaurus albertensis Skeleton cast replica. Dromaeosaurus albertensis is one of the rarest theropods from the American west. They were closely related to Velociraptor but significantly larger. 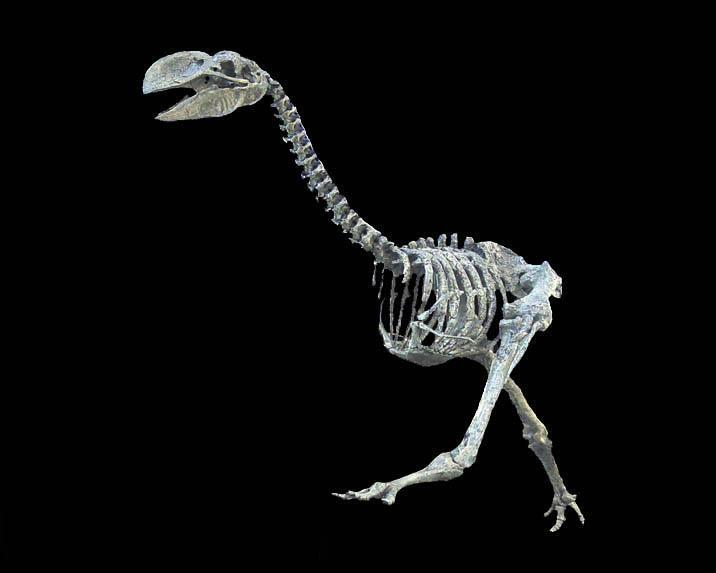 Known only from a collection of partial skeletons, this specimen represents the latest interpretation of its anatomy, composited from several individuals. Fast, agile and vicious, Dromaeosaurs may well have hunted in packs, preying upon the smaller herbivores and probably the sick and young of larger dinosaurs. Attacking with their lethal "killing claw", they were able to inflict mortal wounds on their prey, and then wait for them to expire. Dromaeosaurs make an impressive exhibit as a pack in hunting mode. Measuring approximately 6' by 6' and 8" in thickness, this specimen makes a spectacular impression as a wall mount or presented in a floor exhibit. This pose captures the dinosaur in a naturally presented pose as it, and many other dinosaurs have been found. 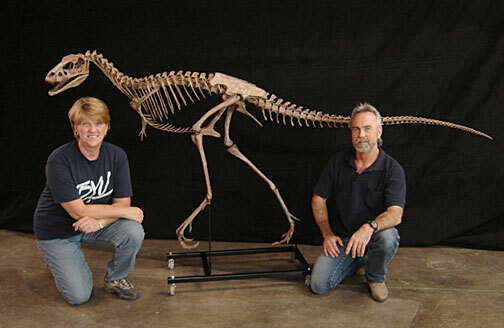 Created from our full scale Dromaeosaur skeleton (above), every detail is captured. Made of lightweight materials it is easy and simple to mount on a wall. This is the most scientifically accurate recreation of a Dromaeosaur in existence today! Dromornis stirtoni ("Stirton's Thunder Bird"). A flightless bird, Dromornis was the largest dromornithid*, it may have been the heaviest bird to have existed. It was 3.2 m tall and estimated to be 500 kg. Discovered in Northern Territory, Australia. *Dromornithidae the dromornithids were a family of large, flightless Australian birds of the Pleistocene Epoch. All are now extinct. They were long classified in the order Struthioniformes, but are now usually classified as a family of Anseriformes. 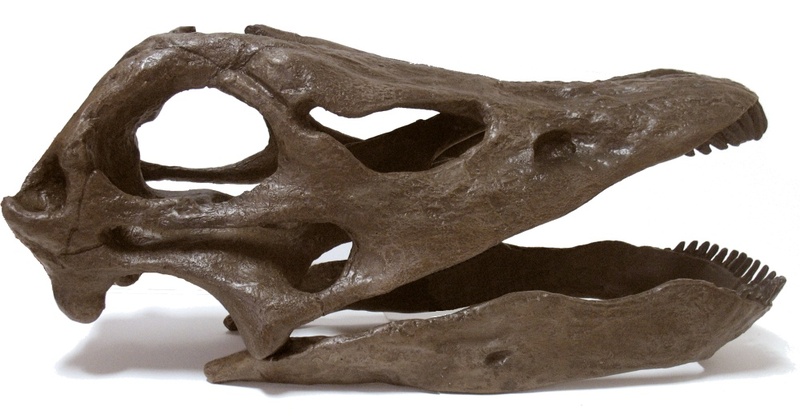 This Dromornis stirtoni cast replica measures approx. 3.2 meters high. See More Bird skulls and skeletons Here. Measures: 7 inches (17.8 cm) length, 3.5 inches (8.9 cm) wide, 4.25 inches (10.8 cm) height. Shipping and crating cost not included. Please contact us for shipping cost. Fossil discovered: Sokolki, Malaya Severnaya (Small North) Dvinia River near Archangel'sk, Northern Russia. 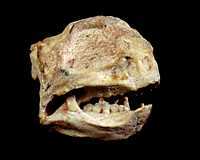 Classification: Therapsida: Cynodontia; Family Dviniidae This small, omnivorous therapsid is clearly advanced in having a temporal opening so large that on only a thin bar of bone remains to separate it from the eye socket. Therapsids' temporal fenestrae were larger than those of the pelycosaurs. The jaws of therapsids were more complex and powerful and the teeth were differentiated into frontal incisors for nipping, large lateral canines for puncturing and tearing, and molars for shearing and chopping food. Therapsids' legs were positioned more vertically beneath their bodies than were the sprawling legs of reptiles and pelycosaurs. 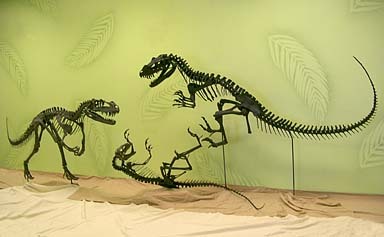 Edmontosaurus annectens skeletons cast replicas. 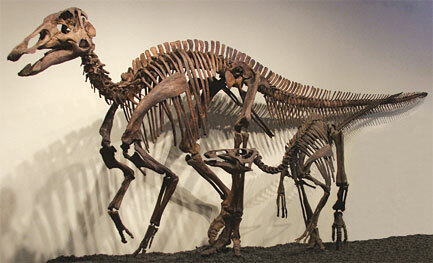 Two truly beautiful Edmontosaurus skeletons, adult and juvenile. Apparently our adult Edmontosaurus survived an attack from a theropod, which left deep gouges in the right dentary and shallower gouges in the left dentary. The Edmontosaur may have pulled away from its attacker, causing the deep wounds. Close examination suggests that the wounds may have begun to heal, leading to the possibility that it survived the attack for awhile, only to succumb to infection and die a short while later. 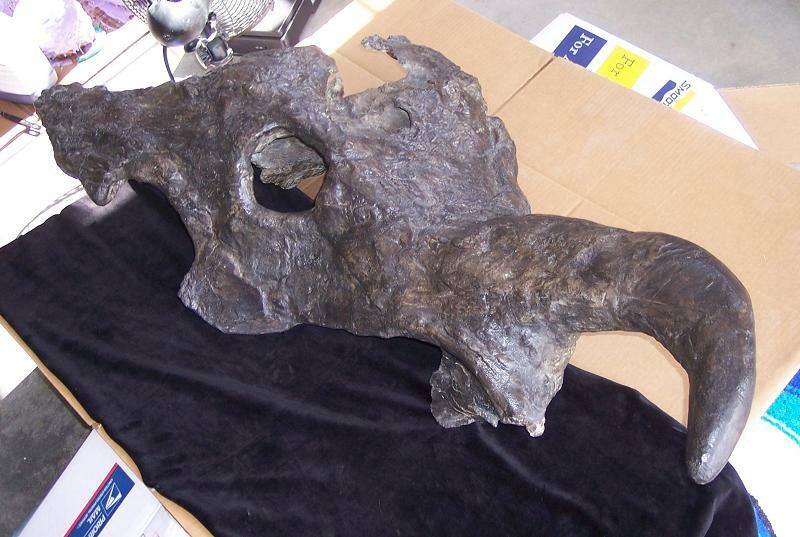 Edmontosaurus (adult) skull cast replica (from above skeleton. Hadrosaurid duckbill dinosaur of Cretaceous Alberta, western Canada. 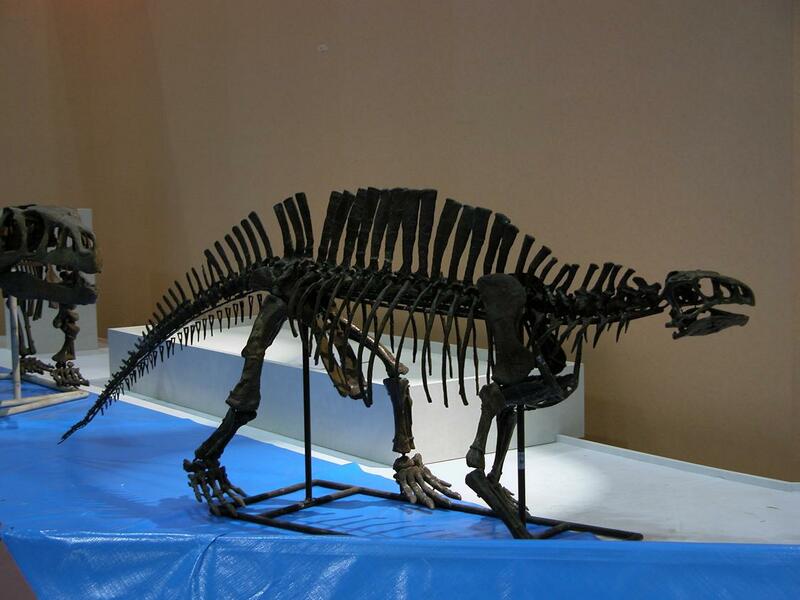 Do you need an Edmontosaurus skeleton? We can get you one (real or replica) - just ask! Edmontosaurus resembled Maiasaura (see Maiasaurus below) in its shape and posture, though the two genera were quite different in size. 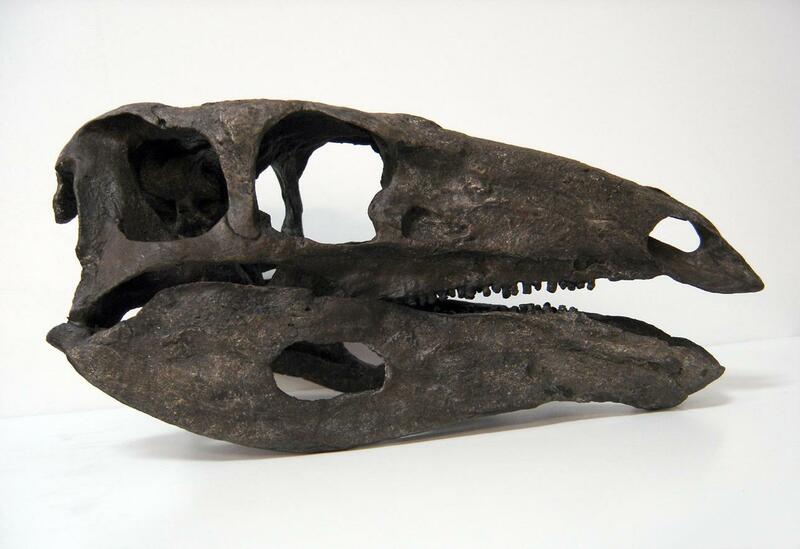 We have access to Edmontosaurus skulls and skeletons (please inquire). 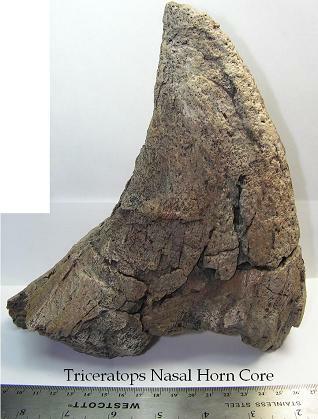 Einosaurus (hooked nose horn). 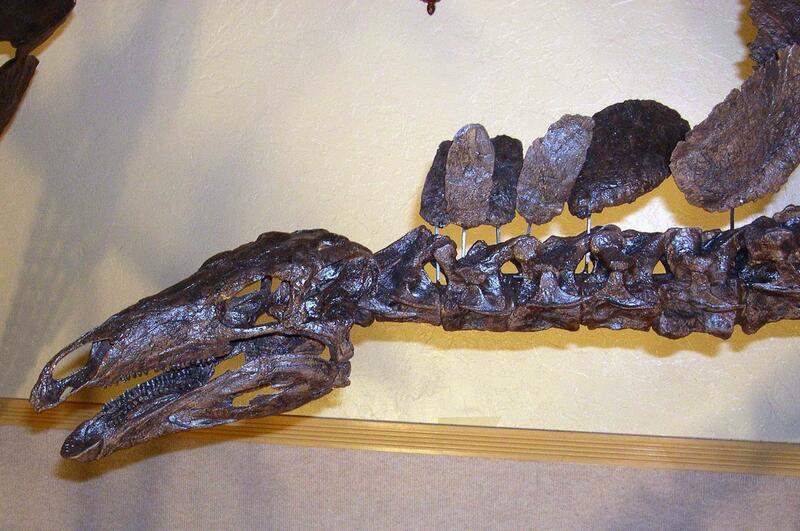 This is a very rare Einosaurus procurvicornus (Einiosaurus) skull with all 3 horns. This is a fairly new discovery (1985) it was named in 1995 and is called "buffalo lizard". It is a medium-sized centrosaurine (short-frilled) ceratopsian from the Upper Cretaceous. 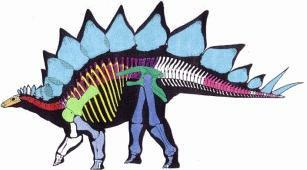 Compared to Triceratops, the Einosaur had a short-frill. Einosaurus was a herbivore. 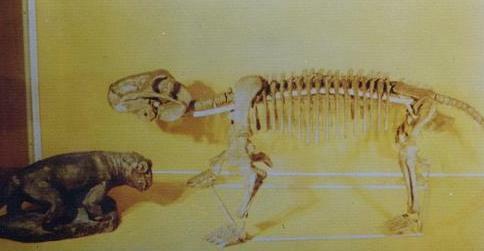 Though a sub adult, this Einosaur would have grown to about 20 ft long. Location: Discovered 2 miles from the Canadian border north of Dupuyer, Montana NW Montana. All previous Einosaurus fossils have been found in Canada. This is a very rare dinosaur skull. Very few have been discovered. This skull is the complete upper skull with braincase. It is missing some frill behind dinosaur's right eye and also the lower jaw. The skull itself has no restoration (only crack filling). The nose horn measures 23 inches. The nose curves downward like a can-opener. Einosaurus had 2 horns off the frill. 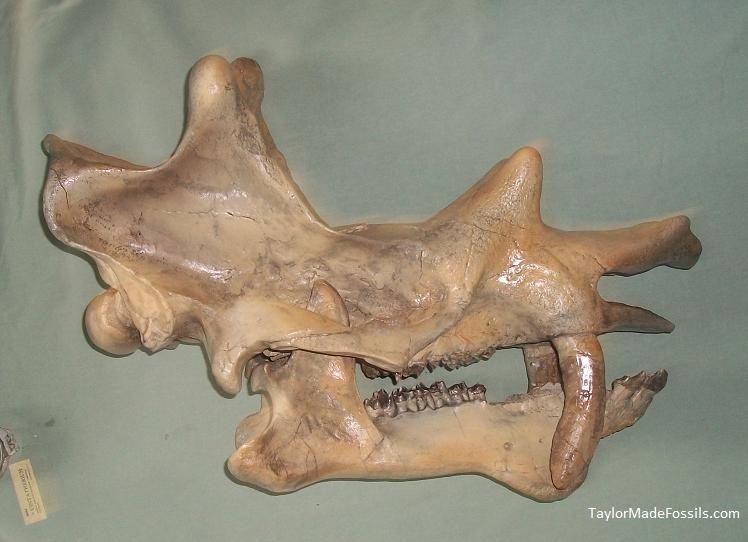 Though not attached, this skull comes with two horns. 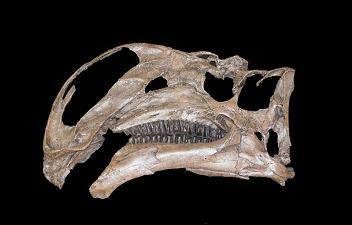 One of these was discovered with the skull, the 2nd comes from a slightly larger member of the same dinosaur. It is a good match for size. These horns are not connected to the skull but can be with a little restoration. 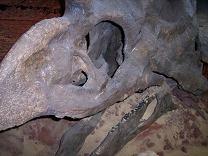 We have seen reconstructed skulls of this dinosaur go for $50,000 to $60,000 while still in the ground! Photo above is for comparison only. 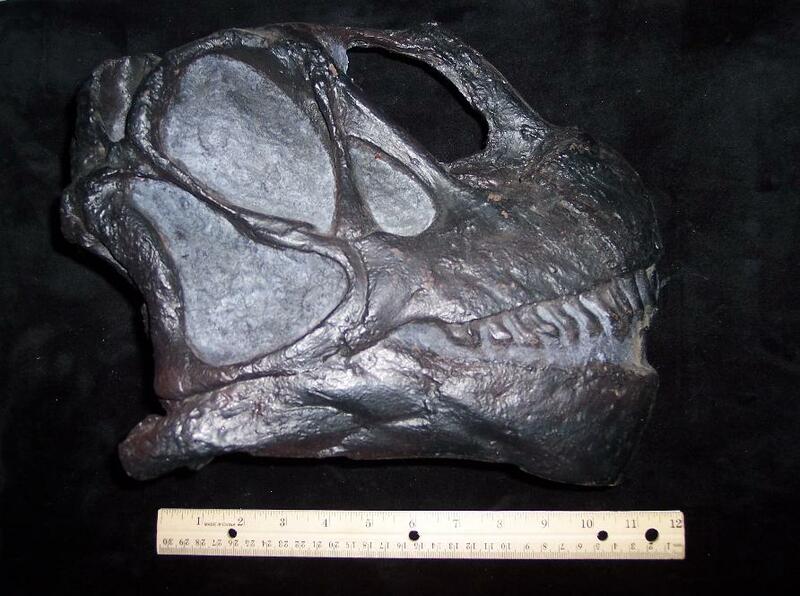 This is an Einosaur skull that was recently up for auction. 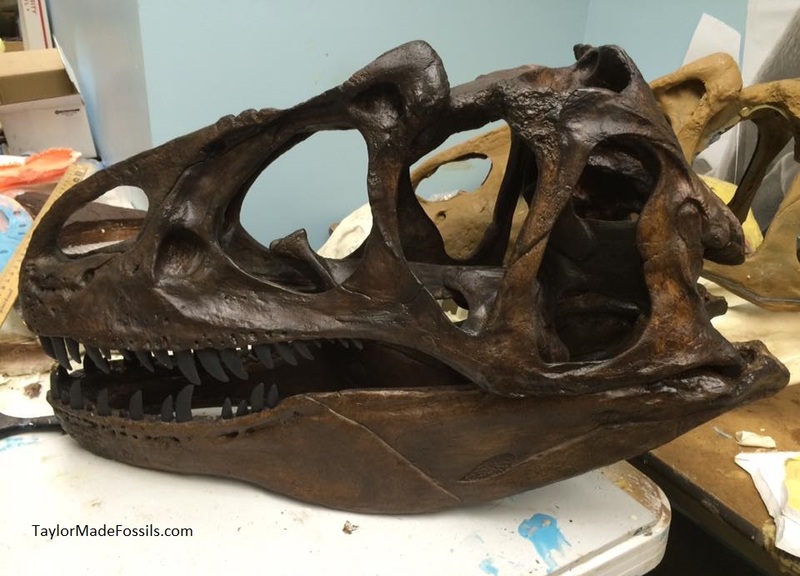 You can compare it to the pictures on the left (and below) and you will see how nicely this skull will look with a little restoration. Legally collected, this skull comes with pictures, and details of the discovery. 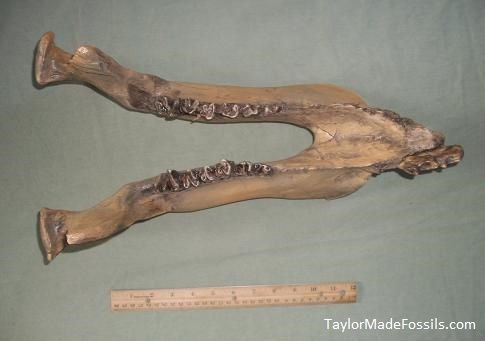 It was found in a ravine with a herd that died from a sudden flood. It is one of most unusual dinosaurs that ever lived and it may have gone extinct due to the horn pointing down (and not being able to use it for defense). Few remains have been found of this animal and most museums do not have any remains of this animal. There are very few people who have this is private collections - so your purchase will make you among the most rare of museums or collectors. 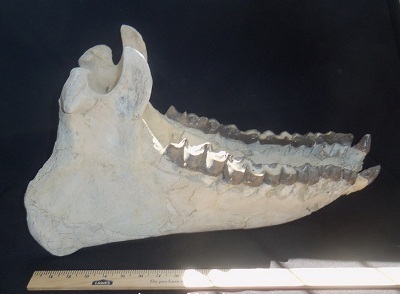 This sub-adult skull measures 44". 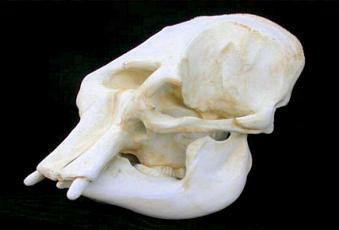 This is an opportunity to get a great skull for an economical price. I fell in love with this dinosaur the second I saw it. It is just beautiful. Displays well on top of a table or any piece of furniture and can safely be carried by two people. I can't say enough about this dinosaur. It is beyond words. Call for more details on this one. Elephant skull cast repliica: Elephas maximus. 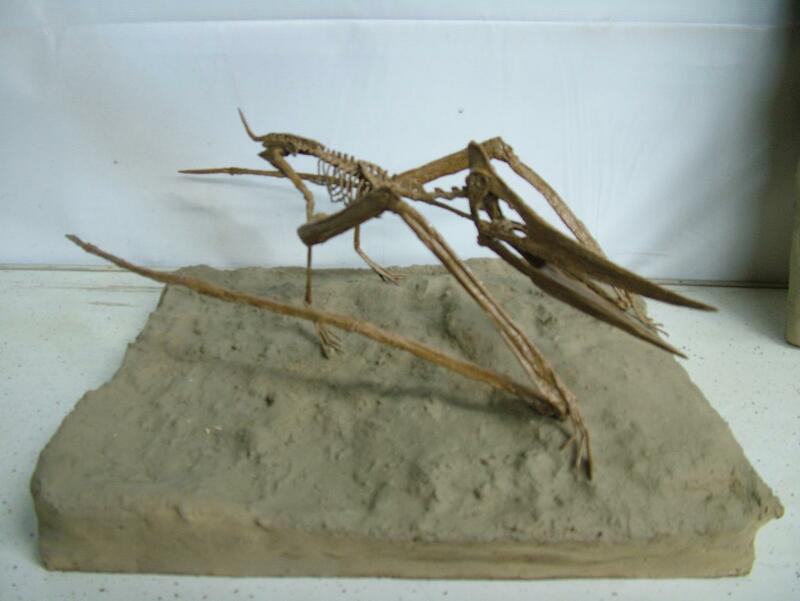 Eryops skeleton cast replica. This large amphibuous tetrapod measues 5.5 feet (1.68 meters). Eryops (pronounced EAR-ee-ops). 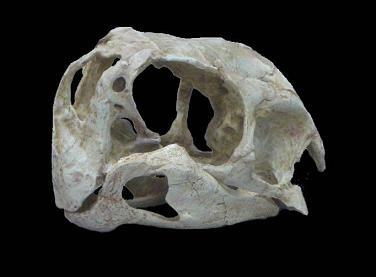 Eryops meaning "drawn-out face" because most of its skull was in front of its eyes (Greek eryein = drawn-out + ops = face) is a genus of extinct, semi-aquatic amphibian found primarily in the Lower Permian-aged Admiral Formation. Gallimimus bullatus was the largest of the ornithomimosaurs. Totally without teeth, it may well have been an omnivore, feeding on seeds, fruits as well as small vertebrates and large insects. 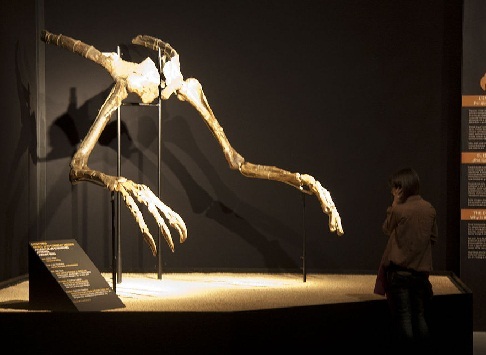 Gallimimus bullatus belongs to a family once called the Struthiomimidae, the 'ostrich mimics'. 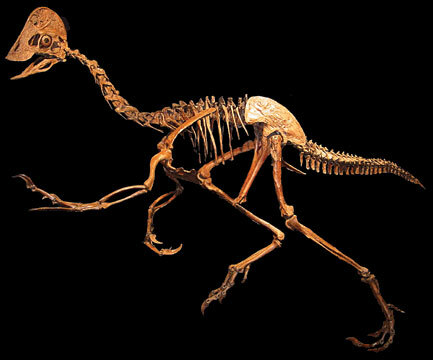 The structure of the limbs and tail suggests that like the ostriches, the struthiomimids, or ornithomimids as they are more properly known, were capable of running quite fast. Giraffe: Real Giraffe skeleton available for sale. 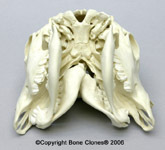 We have one adult female skeleton for sale. Skeleton is not yet assembled but was from an individual approx 14ft tall. This skeleton is from a natural death. Cast replica skeleton coming soon. Giganotosaurus (pronounced "JYE-ga-NO-toe-SORE-us") is a genus of carcharodontosaurid dinosaur (early Cenomanian stage of the Late Cretaceous Period). It is one of the largest known terrestrial carnivores, slightly larger than Tyrannosaurus, but smaller than Spinosaurus. Its fossils have been found in Argentina. The name means "giant southern lizard", derived from the Ancient Greek gigas "giant", notos meaning "south wind" and saurus meaning "lizard"
$55,000 Please contact us for pictures and more information. Glossotherium (literally "Tongue Beast") was a genus of ground sloth. It was a heavily built animal with a length of about 4 metres (13 ft) snout to tail-tip, a weight estimated at 1002.6 kg (2210.4 lb), and could potentially assume a slight bipedal stance. Please contact us for more information. Glyptodont Skeleton: Panochthus tuberculatus casts. Please contact us for more information. 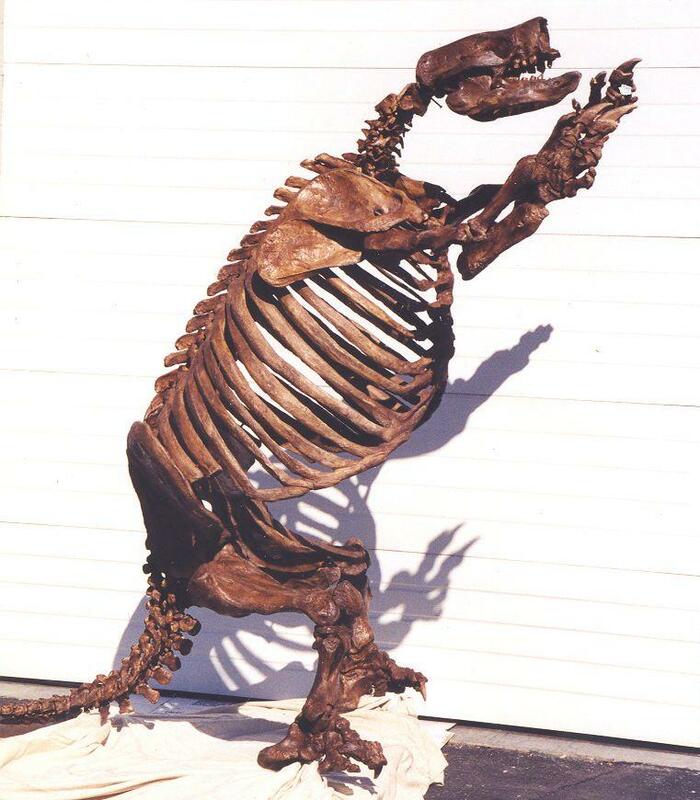 Real fossil glyptodon skeleton available for sale. Please contact us for more information. 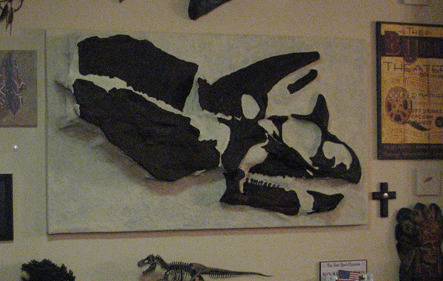 Gryposaurus Skull Plaque cast replica. 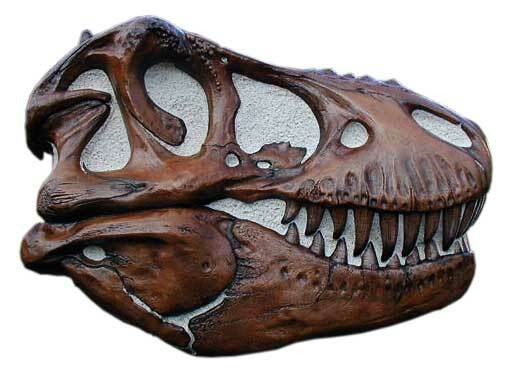 Attractive dinosaur skull wall-hanging plaque. This dinosaur cast measures approx. 70cm wide. For Hesperosaurus please see Stegosaurus . Hudiesaurus sinojapanorum vertebra cast replicas. 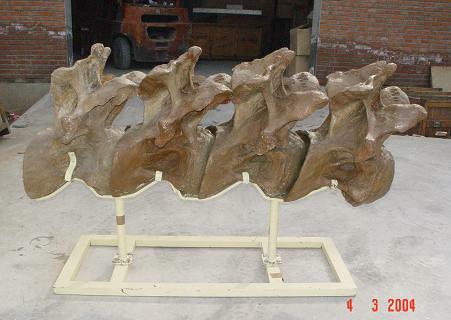 This series of dinosaur vertebra were molded from original fossils discovered in Tulufan Basin, Xinjiang. 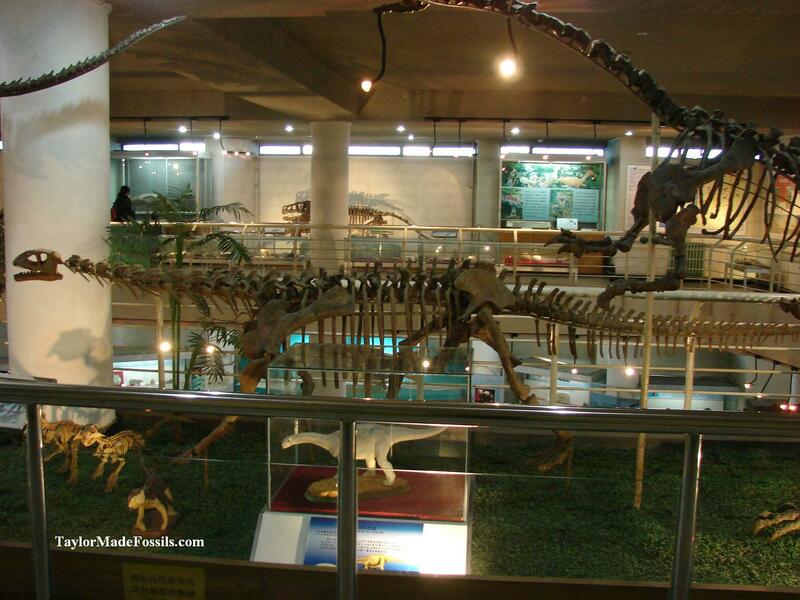 Hudiesaurus (meaning "butterfly lizard") is a genus of dinosaur from China. 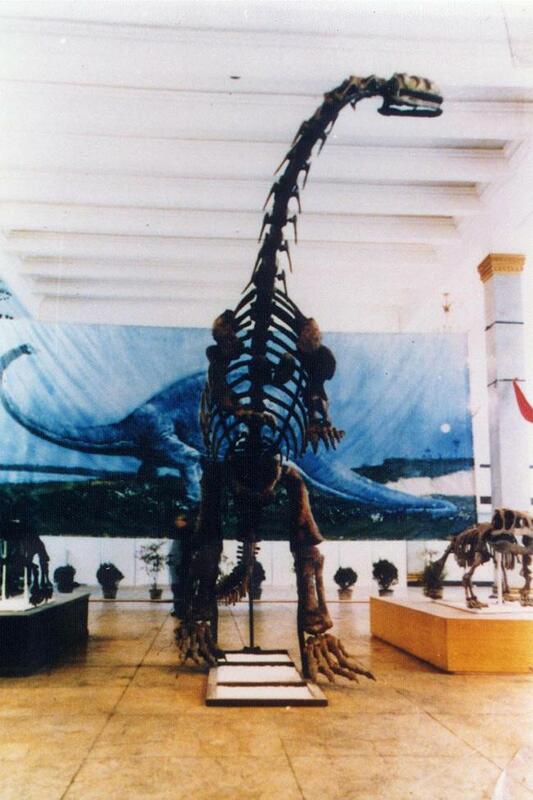 A sauropod, it may have been related to Mamenchisaurus. Discovered in the Gobi Desert, Southwestern Mongolian Peoples' Republic. Its hands had four fingers and a spike-like thumb, which it may have used to defend itself. 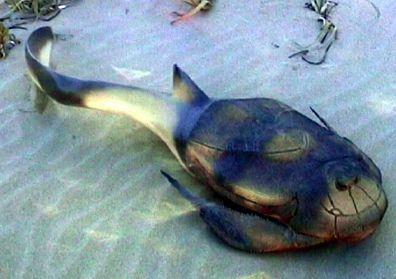 Its teeth are reminiscent of those in hypsilophodonts, flattened side to side, and leaf-shaped. They probably sliced up plant material like a pair of scissors. Because of the large number of skeletons of these dinosaurs frequently found together and evidence from fossil track ways, palaeontologists think they may have formed herds. Their remains are most often found in sediments deposited in swampy, lake and river edge environments suggesting that is the place they spent most of their time munching on horsetails (like the living Equisetum), ferns, cycads and various kinds of conifers. 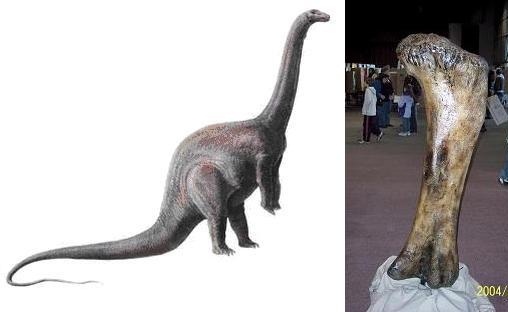 Iguanodon orientalis from Mongolia (above) is very similar to iguanodonts from Europe (below) except for its huge, bulbous 'nose.' This hollow structure may have been used as a resonating chamber for making 'dinosaur music or mating calls. 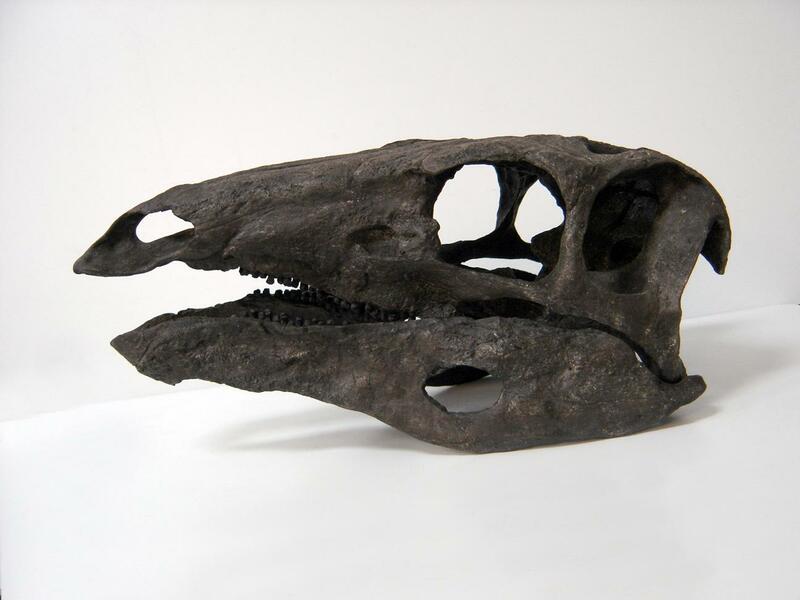 If you are looking for Iguanodon atherfieldensis, Iguanodon bernissartensis, or Iguanodon Mantelli cast replicas skulls or skeletons just ask us. 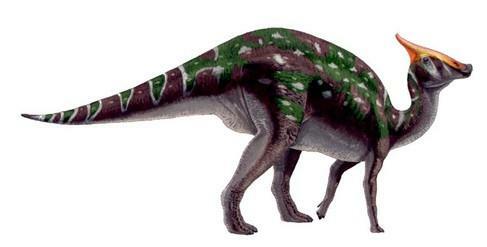 Iguanodon sp. skeleton cast replica. 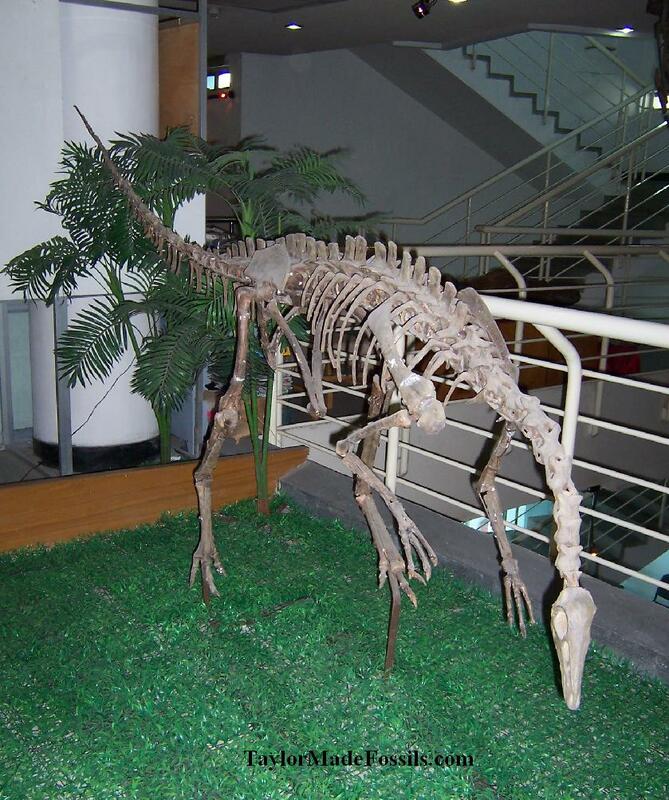 Klameilisaurus gobiensis skeleton cast replica. 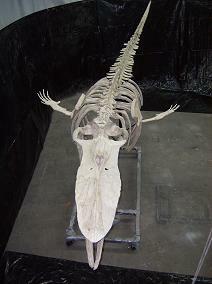 Lotosaurus adentus skeleton cast replica. 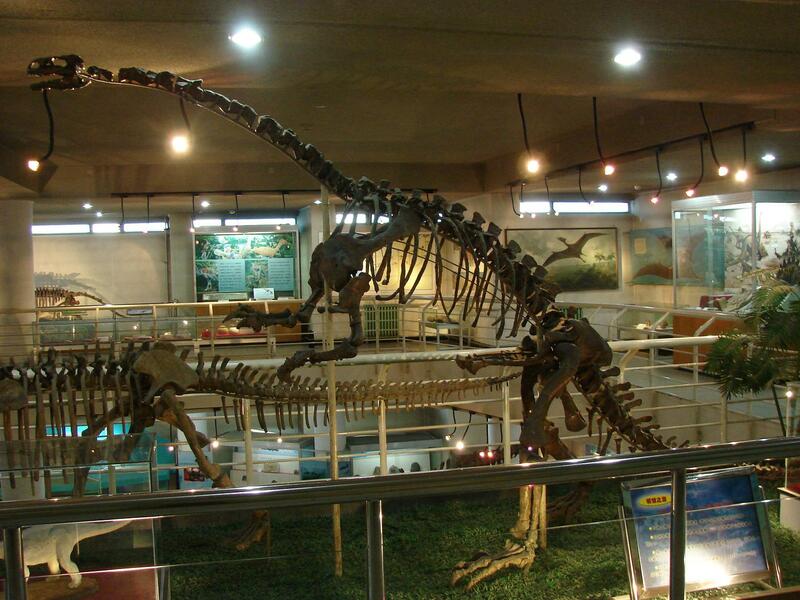 Lotosaurus is an extinct genus of rauisuchian archosaur that lived in China. It was a heavily built quadruped. It was a herbivore, biting off leaves with its toothless jaws. Lotosaurus, like other members of the family Ctenosauriscidae, had a sail on its back. It looked similar to that of Permian pelycosaurs like Dimetrodon and Edaphosaurus, although not as high. It may have been used for display and/or body temperature regulation. Lufengosaurus, meaning "Lufeng Lizard"), was a prosauropod dinosaur which lived during the Early and Middle Jurassic period in what is now southwestern China. 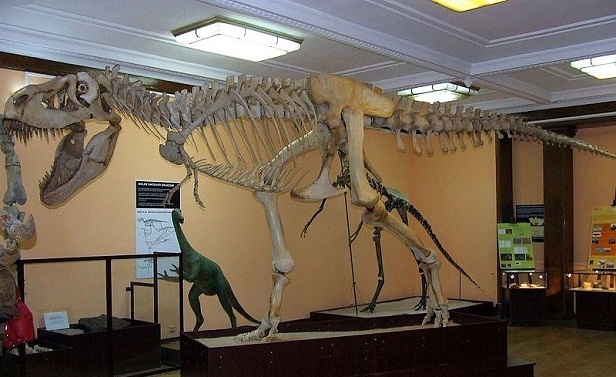 This skeleton was discovered in Astashikha, Nizhegorodskaya Region, Russia in Early Triassic sediments. 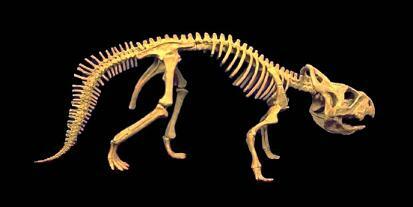 Lystrosaurus has long been known from many parts of the world, although it has yet to be found in Australia. As in another mammal-like reptiles Dicynodon, ("Two Dog-teeth") the teeth of Lystrosaurus were reduced to a pair of tusks. 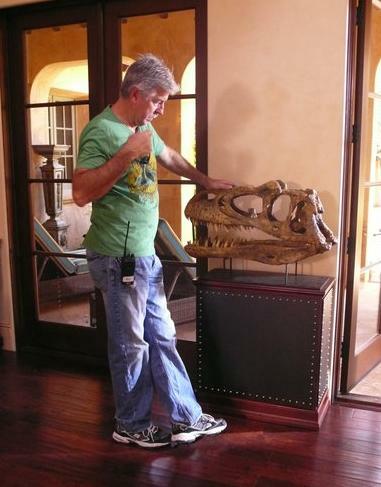 Both of these reptiles appear to have been herbivores. The structure of the skull, with the nostrils and eye sockets placed near the top of the head, the snout turned down at the tip and the teeth and jaws placed low, all suggest that Lystrosaurus was an amphibious feeder, in much the same fashion as the hippopotamus. 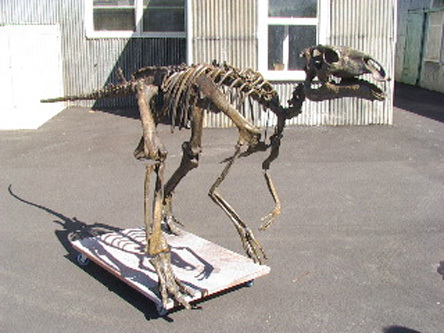 Maiasaur Juvenile skeleton cast replica. Maiasaura (meaning "good mother lizard") is a large duck-billed dinosaur genus that lived in the area currently covered by the state of Montana in the Upper Cretaceous Period (Campanian). It is only known from the upper Two Medicine Formation. From Cretaceous Montana. This is a free standing mount. Cast in durable resin. Skeleton measures 7ft (2.1m) long and 5ft (1.5m) high. Real Alaskan Woolly Mammoth Skull for sale. Alaskan Mammoth Skull, Mammuthus primigenius � Pleistocene. This skull was found in a gold mining operation in Alaska. The tusks have natural blue, tan, and cream colors. Each tusk weighs in around 100 pounds. The front of the skull has repair because a D-9 bulldozer scraped the front surface of the skull during mining operations. This was a bull male woolly mammoth. Length: 88 inches. Height: 83 inches. Width: 47 inches. This is a real fossil Mammoth skeleton (not a cast). Price starting at $99,000 depending on which skeleton you choose. I have several to choose from. We also have a cast of Mammuthus primigenius skeleton available ($85,000 skeleton or $8,500 skull). This is the largest most complete wooly mammoth ever found in North America. I will glady email you pictures of all. Maiasaura (meaning "good mother reptile" or "good mother lizard" ) is a large herbivorous hadrosaurid ("duck-billed") dinosaur genus that lived in the area currently covered by the state of Montana in the Upper Cretaceous Period. This "dig panel" Measures approx 4 feet by 4 feet. 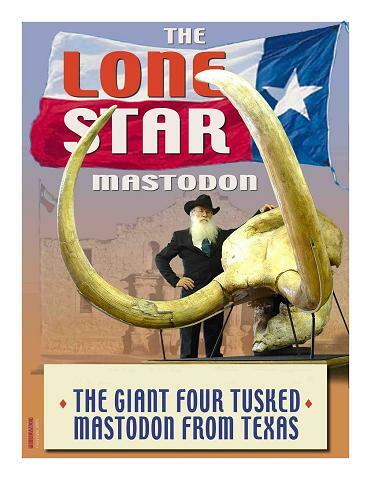 This is the Largest Mastodon ever found. It is 20% larger than the Warren Mastodon of the Museum of Natural History, NY. It is 14% larger than the Burning tree Mastodon from Ohio. The skull is that of an (aprox) 35 year old male 4 tusked Mastodon. The bottom 2 tusks extend from lower jaw. 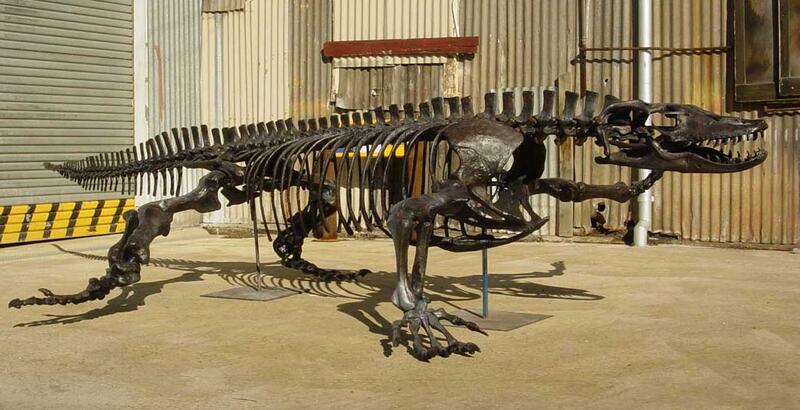 This amazing Megalania prisca ("ancient giant butcher") skeleton was discovered in South-eastern Queensland, Australia. It comes from the Pleistocene. Megalania was a giant lizard, reaching lengths of up to 6 meters which makes it the largest terrestrial lizard that ever lived. Megalania was once thought to belong to a distinct genus called Megalania prisca, it is now recognized as a species in the genus Varanus, which includes all monitor lizards. 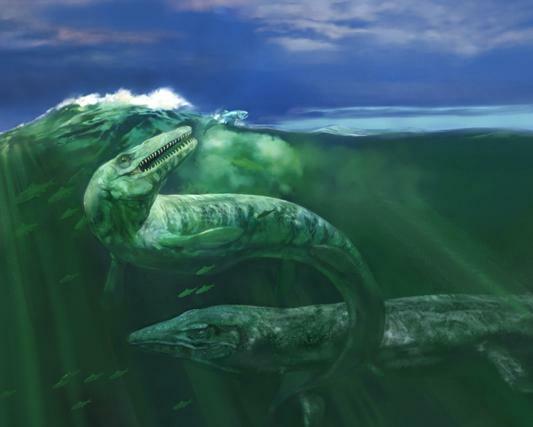 With the extinction of the ichthyosaurs and pliosaurs, mosasaurs became the dominant marine predators. 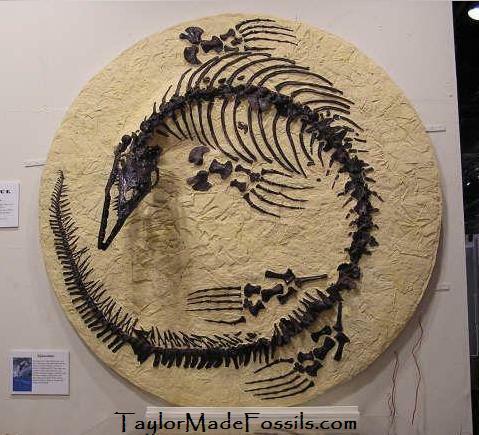 This amazing Mosasaur fossil is 98% complete. 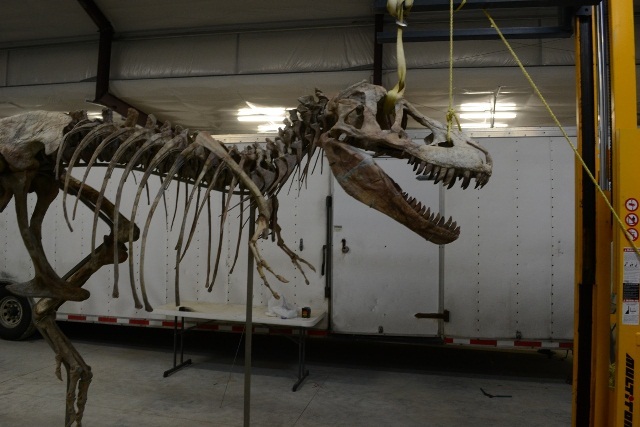 A great chance to own an actual Mosasaur skeleton. 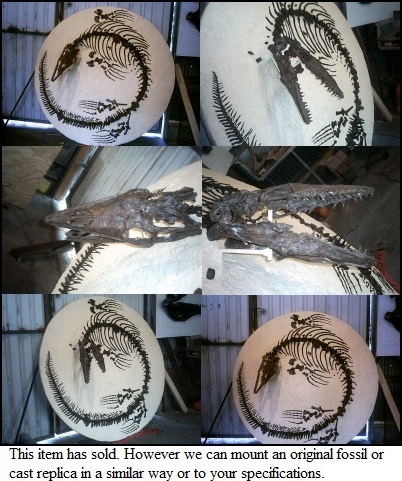 The Platecarpus skeleton is mounted on a 7ft fiberglass disk. 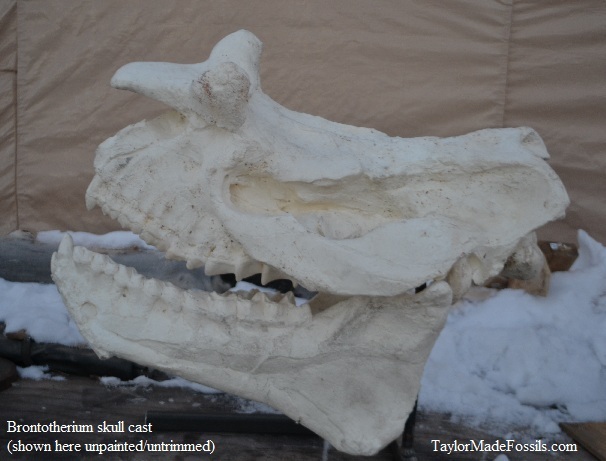 We also have about 8 other real Mosasaur skulls and skeletons for sale. Please call or email for pictures and price. 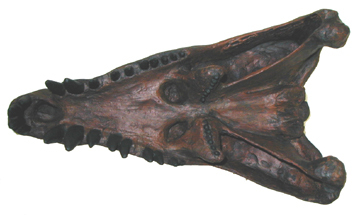 Mosasaur skull cast replica. Molded from an original fossil discovered in Kansas. 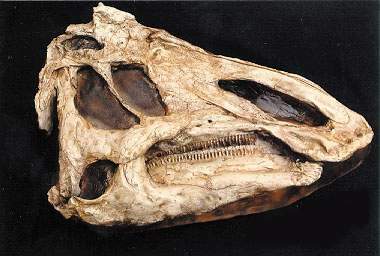 This skull measures 45in (114cm) long. Comes with stand. This item will be shipped by UPS in 2 oversize boxes (70 lbs). 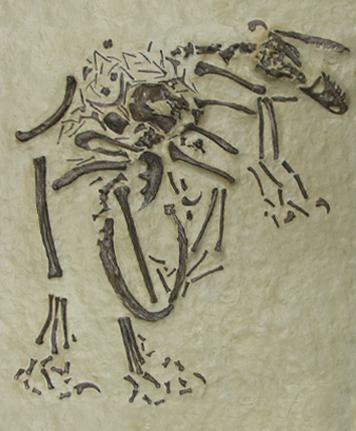 Anzu wyliei was discovered by Fred Nuss of Nuss Fossils. 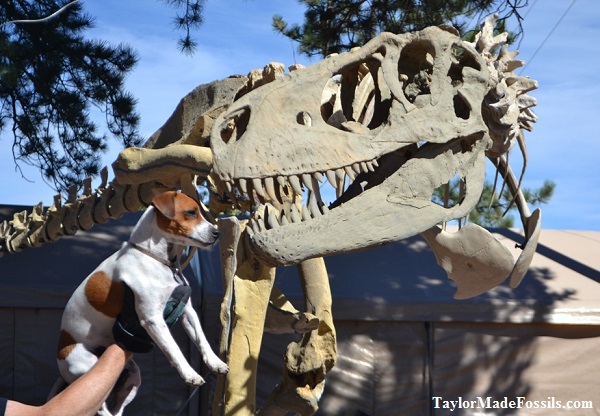 Fred and his bride, Candace, spent their honeymoon hunting fossils when Fred discovered the site in November of 1998. This large theropod is the largest dinosaur of its type from North America. It was fast and ferocious, with legs built for speed, forelimbs more than a meter long with large, sharp claws, a sharp beak and almost certainly a bad attitude. Becoming popularly known as the "Chicken from Hell", Anzu wyliei will make a fabulous addition to your displays, telling a story of diversity at the end of the age of dinosaurs. 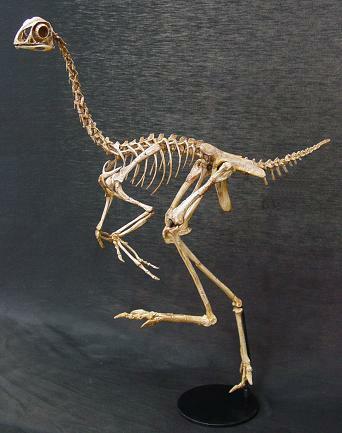 Anzu wyliei skeleton cast replica. 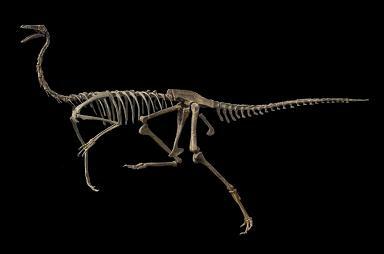 This new species of giant Oviraptorid theropod was fast and ferocious, with forelimbs more than a meter long, a sharp beak and almost certainly a very bad attitude! Combining primitive and highly specialized features, Pachycephalosaurus has been one of the most interesting dinosaurs since their discovery. Our Pachycephalosaurus is the only specimen of this species ever discovered preserved with the skull associated with the skeleton. The bizarre appearance and rarity of this specimen make it both a research and a display prize for any museum. Measures: 21 1/2 inches long x 11 1/2 inches high. 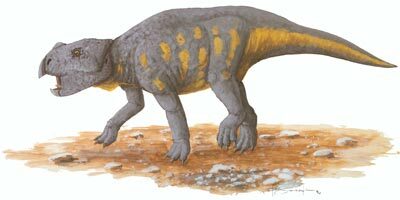 This new Dinosaur species was found in 1992 by Cameron Campbell. 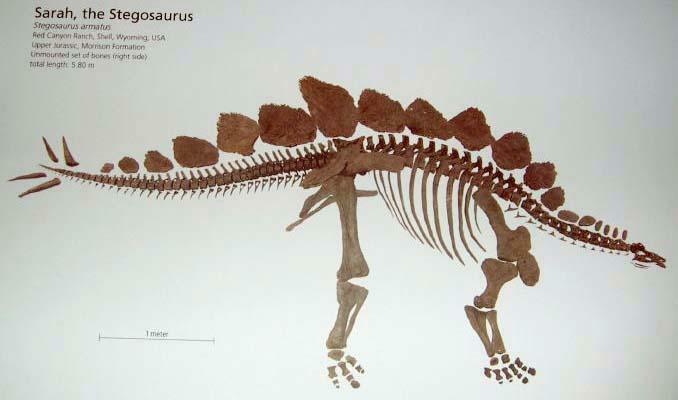 Pawpawsaurus, meaning "Pawpaw Lizard", is a nodosaurid ankylosaur from the Cretaceous of Tarrant County, Texas, discovered in May 1992. The only species yet assigned to this taxon, Pawpawsaurus campbelli, is based on a complete skull (lacking mandibles) from the marine Paw Paw Formation (Wachita Group). 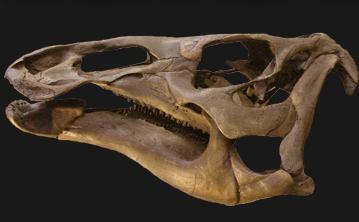 This is the only nodosaurid known to have possessed the bony eyelids commonly found in ankylosaurids. 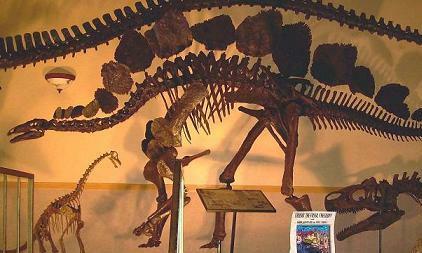 Based on the dimensions of the skull, Pawpawsaurus is believed to have been approximately 15 feet long. 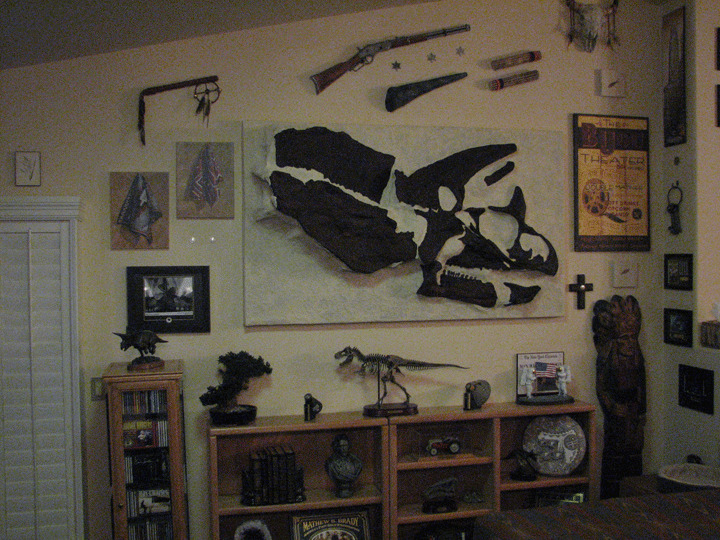 Plesiosaurus dolichodeirus skeleton cast replica panel. This skeleton cast is made of resin/fiberglass and measures 72x30 inches. Plesiosaurus (pronounced: plee-zee-oh-SAWR-us). It's name comes from the Greek: plesios, which means "near to" + sauros, meaning: "lizard"). Plesiosaurus was a large (about 3 to 5 meters long), marine Sauropterygian reptile that lived during the early part of the Jurassic Period, and is known by nearly complete skeletons from the Lias of England and Germany. It was distinguished by its small head, long and slender neck, broad turtle like body, a short tail, and two pairs of large, elongated paddles. 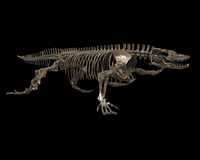 It lends its name to the order Plesiosauria, of which it is an early but fairly typical member. Plesiosaurus was one of the first of the "antediluvian reptiles" to be discovered (by Mary Anning), and excited great interest in Victorian England. It was so-named ("near lizard") by William Conybeare, to indicate that it was more like a normal reptile than Ichthyosaurus, which had been found in the same rock strata just a few years previously. Each cast is hand made and hand painted. As a result, the color of casts may vary slightly. Pachycephalosauridae and Homocephalidae Prenocephale prenes and Homalocephale calathocercos are both pachycephalosaurids, literally 'thickheads'. The top of their skulls were 8 to 10 centimetres thick, solid bone apparently protecting a walnut-sized brain. 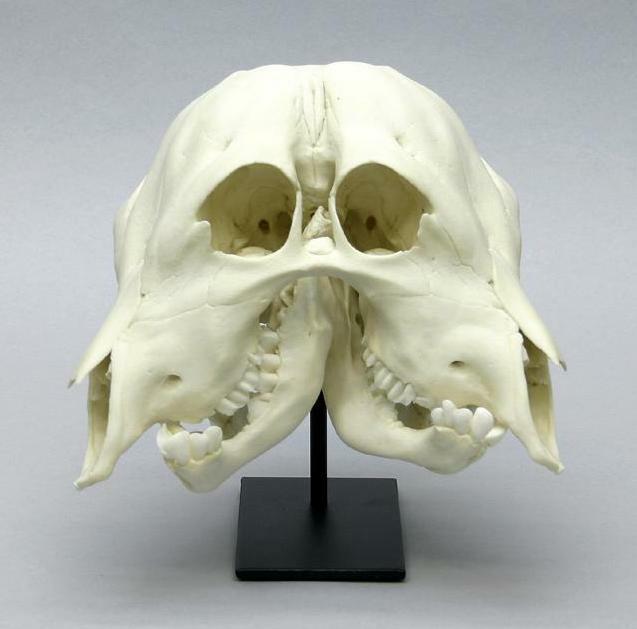 This thickening of the skull has been interpreted as allowing these animals to act like the living mountain sheep in which the males compete for females by holding head-butting contests. 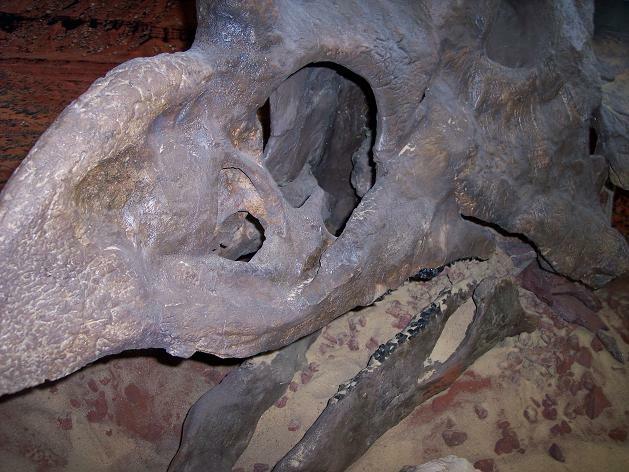 In addition to the domed heads other indications that these dinosaurs head butted can be seen in the stiff spinal column, thus giving it strength for the forces applied when contact occurred, and the angle of articulation of the skull and the neck vertebrae-which puts the head in just the right position to make butting safe and not a back-breaking exercise. These dinosaurs have very small teeth with serrated crowns, ideal for shredding plant material. Pachycephalosaurids may have had a lifestyle very like that of modern sheep and goats and even may have moved about in small herds. 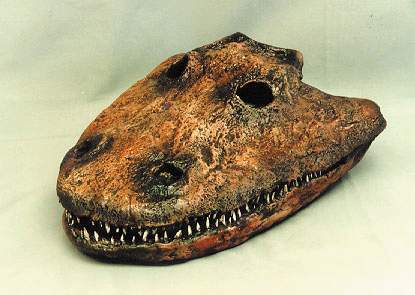 meaning of Name: "Before the Bactrian reptile"
Probactrosaurus is classified as: Ornithopoda; Iguanodontia; Iguanodontidae. Probactrosaurus skeleton. It's fossils have been found in the Early Cretaceous (Aptian-Albian) sediments. Discovered in the Alashan Desert, Inner Mongolia, China. 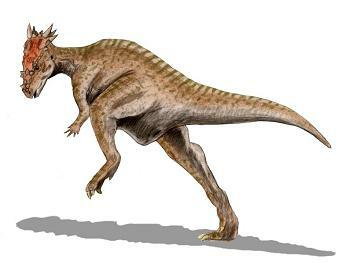 Prosaurolophus (meaning "before Saurolophus", in comparison to the dinosaur with a similar head crest) is a genus of hadrosaurid (or duck-billed) dinosaur from the Late Cretaceous of North America. It is known from the remains of at least 25 individuals belonging to two species, including skulls and skeletons, but it remains obscure. 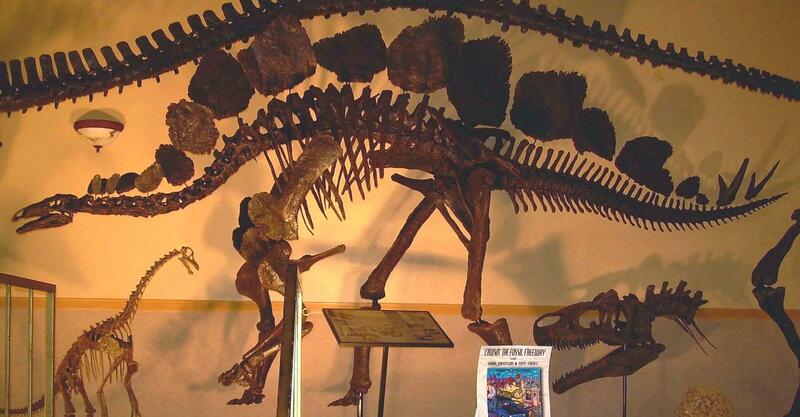 Around 9 meters long (29.5 ft), its fossils have been found in the late Campanian-age Upper Cretaceous Dinosaur Park Formation in Alberta, and Montana. 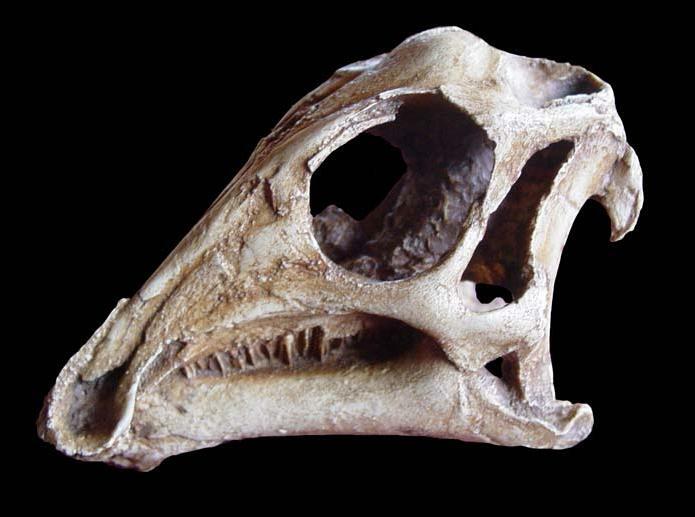 Its most recognizable feature is a small solid crest formed by the nasal bones, sticking up in front of the eyes. 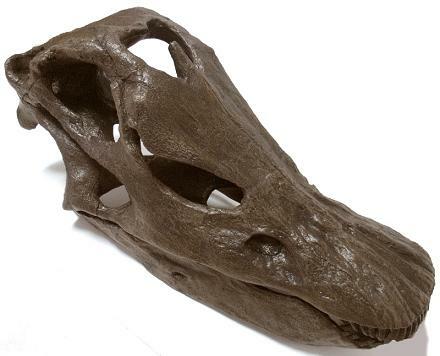 Beautiful duck-billed dinosaur skull replica cast in resin. 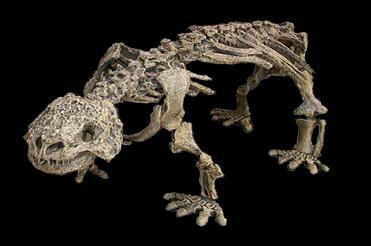 This wonderful Protoceratops juvenile skeleton is 35cm in length. 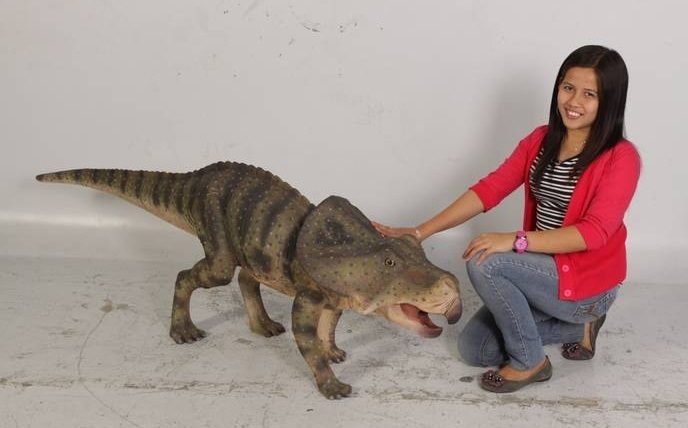 This great life-size model makes a great companion to a Protoceratops skeleton or any museum display. We used our Protoceratops skeleton as a reference for sculpting this piece. Made of sturdy fiberglass and resin. A Taylor Made Fossils exclusive! Psittacosaurus Skull cast with optional base. This beautiful skull cast measures ___ without stand. 'Ptweety' the Worlds Tiniest Pteranodon. Original specimen discovered by Ken Jenkins. 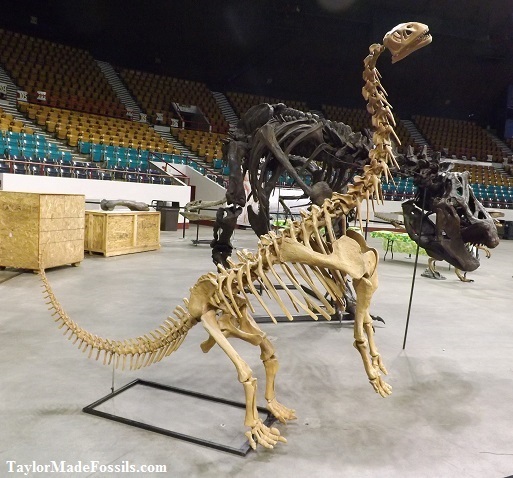 This skeleton was prepared, reconstructed, then molded and cast by Todd Hoelmer. 'Ptweety's skull measures 6" in length. The maximum wingspan is approx 5'. 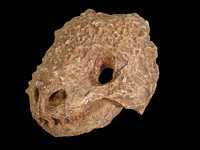 This skull measures 13 inches (33 cm) length, 3.75 inches (9.5 cm) wide, 6 inches height. 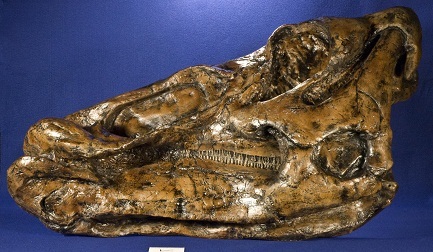 The only cast available from the original fossil material. We have dozens of photos if interested. 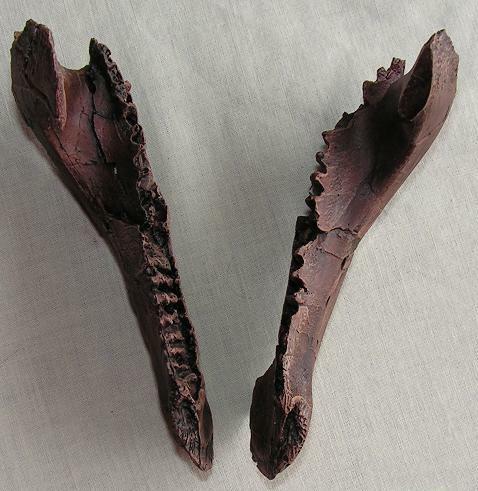 We have Authentic Fossil Woolly Rhinoceras skulls, Woolly Rhino skeletons and legal fossil rhino tusks for sale. Please see our Wooly Rhino page. Sarcosuchus imperator (flesh eating crocodile), nicknamed Supercroc, (Cretaceous). With an estimated body length of 40 feet, and a skull over 5 1/2 feet long, Supercroc is one of the largest crocodiles that ever walked the Earth. The Sarcosuchus's jaws are lined with over 100 teeth. 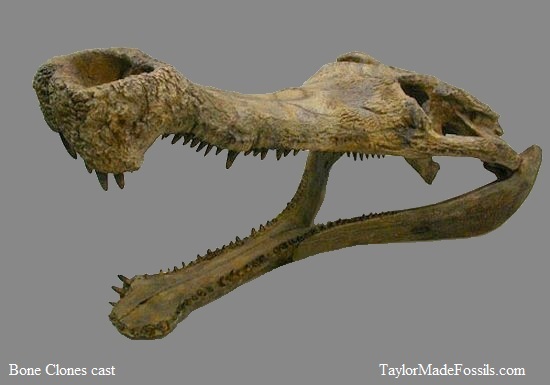 Unlike modern crocodilians whose teeth interlock, Supercroc's lower teeth fit inside its uppers, leading scientists to the conclusion that Sarcosuchus imperator did not limit its diet to fish. It is believed that Sarcosuchus was an ambush predator capable of killing large dinosaurs that wandered too close to the water's edge. The Sarcosuchus's unusual bulbous snout is thought to have given it a greater ability to smell prey and make louder sounds. This gigantic crocodilian was first discovered in the Sahara desert by Albert-Felix de Lapparent (1964) and named by France de Broin / Phillipe Taquet (1966). Skeleton of a herbivorous scutosaur, a primitive reptile. 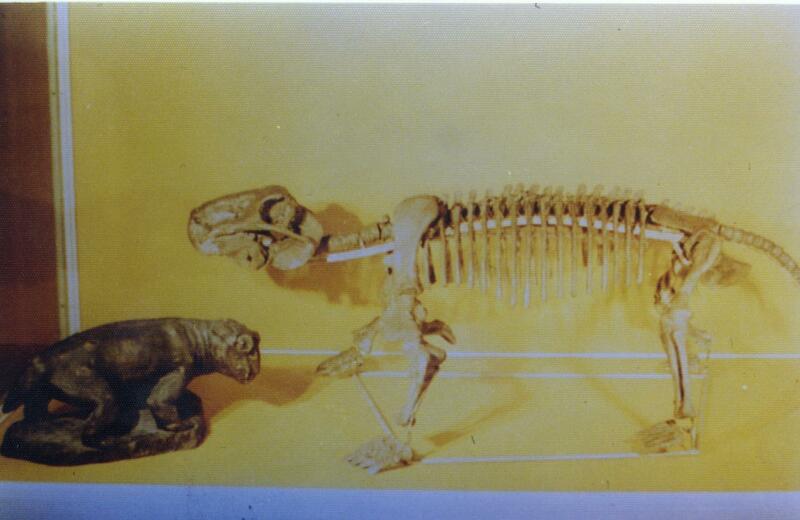 Several skeletons of this large animal were found together in a flood channel sand deposit by Prof. V. P. Amalitzky. Scutosaurus ("shield Reptile") was a genus of armor-covered pareiasaur, perhaps as much as 3.5 m long, which lived in Russia, in the later Permian period. Its genus name refers to large plates of armor scattered across its body. 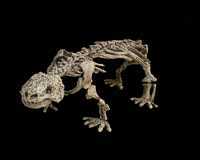 It was a large anapsid reptile that, unlike most reptiles, held its legs underneath its body to support its great weight. Resin cast replica $4,425.00* USD ($4,610.00 AUD) (or less please inquire). Skull also available separately. Paramylodon harlai Harlan's Ground Sloth Skeleton cast replica. 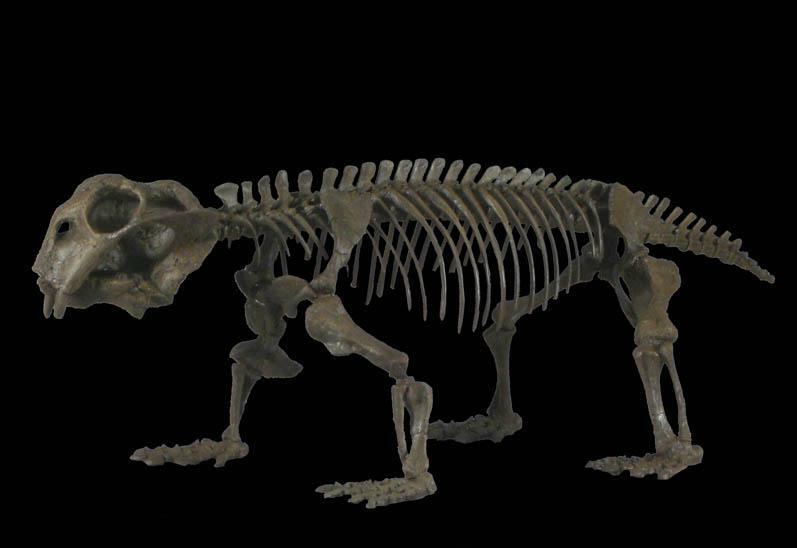 Paramylodon is an extinct genus of ground sloth known from North America deposits in Mexico and the United States. Currently there is just one recognized species, P. harlani, that is commonly referred to as Harlan's ground sloth in honor of American paleontologist Dr. Richard Harlan who first discovered and described a lower jaw in 1835. Paramylodon exhibits an interesting character of having had dermal ossicles, small bones embedded in the skin. This would have provided an interesting degree of protection to the animal, and this character is also shared by the South American Mylodon. Sloth skeleton cast replica skeleton. 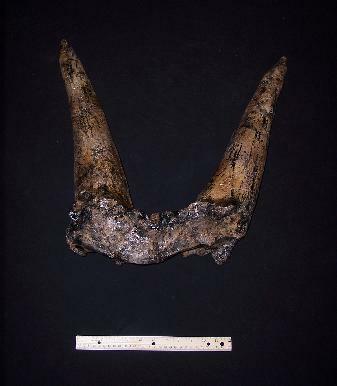 Cast in Polyurathane from an original fossil,from Late Pleistocene Rancho La Brea LACMNH license. $17,325.00 (mounted and crated). Shipping not included. Full size mounted stegosaurus skeleton mount. 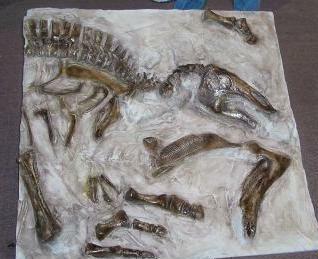 Stegosaurus stenops skeleton panel cast. This wonderful Jurassic skeleton panel measures approximately 15 x 8 feet and is cast in the finest materials, and is available for both display $13,000 or $6,995 for a playground version. Both are beautiful, but the first is more suitable for professional display. We also take checks, money orders and credit cards. This cast measures 20 inches long (51cm). 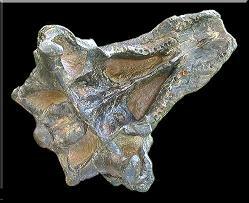 It is cast from the famous armored dinosaur Stegosaurus. This specimen is from the Jurassic of the Morrison Formation, Cleveland Lloyd Quarry, Utah USA. Color of casts may vary. 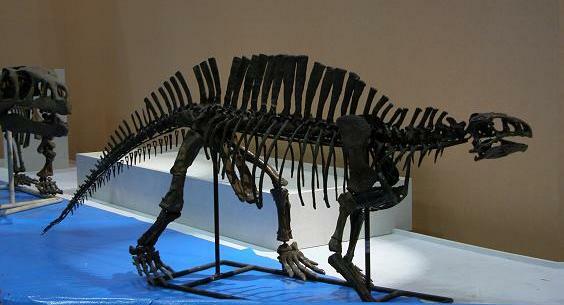 Sarah the Stegosaurus is one of the most complete and most remarkable Stegosaurus skeletons ever found. Above is picture of Sarah while she was at the Swiss prep lab. This photo shows her skeleton partially prepared. We also have pictures of Sarah's bones before prep work. 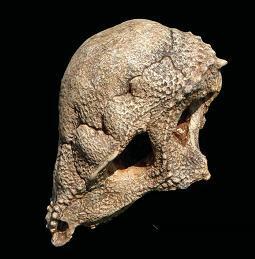 Is one of the most renowned, near-complete skulls. It was missing only the left orbital, left jugal, prefrontals, and lacrimals. 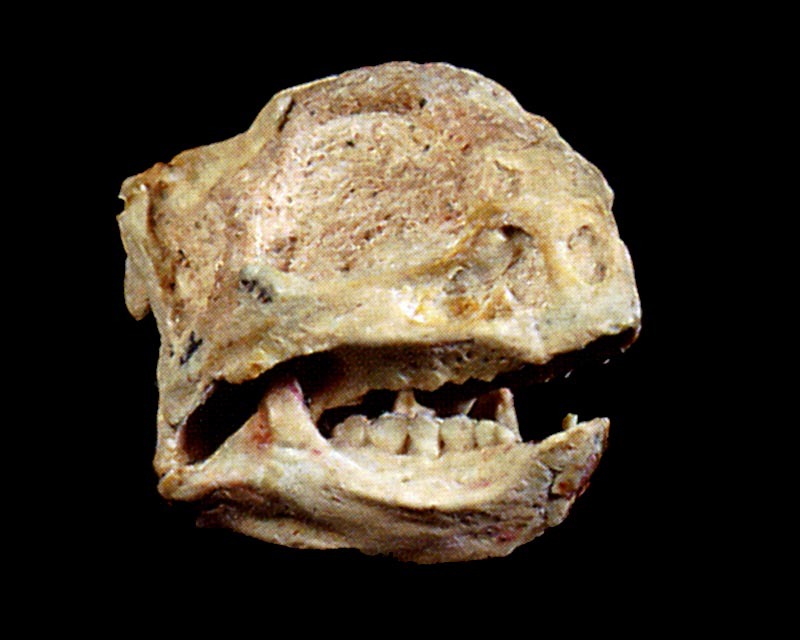 It has 32 preserved teeth. The color map shows how complete the skeleton is. The white area is missing bone (the missing bones can be filled in with casts). The aerial shot shows Sarah still in the ground. 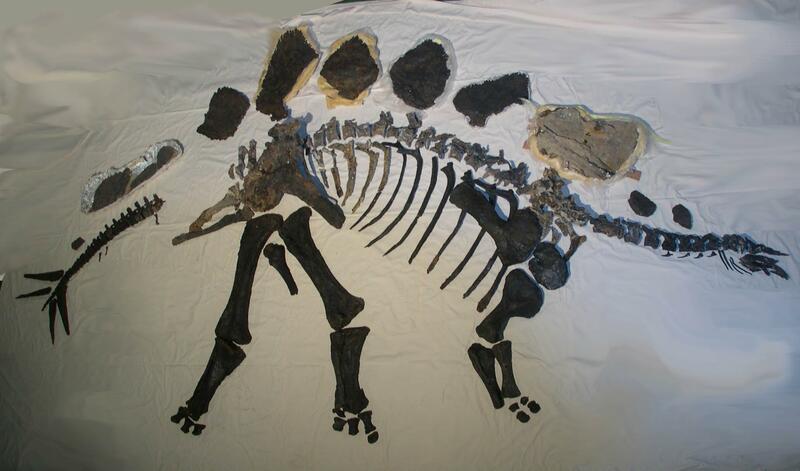 This amazing stegosaurus skeleton was discovered in July 2004 on private ranch land in WY. The skeleton is over 90% complete. 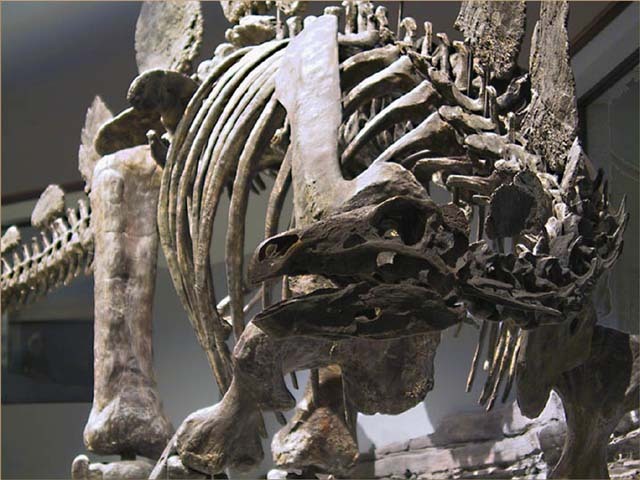 It is a well articulated sub-adult Stegosaurus armatus and represents one of the most complete, well-preserved Stegosaurus specimens ever found. Sarah has the most complete series of dermal armor ever found. There are 18 plates and four spikes. 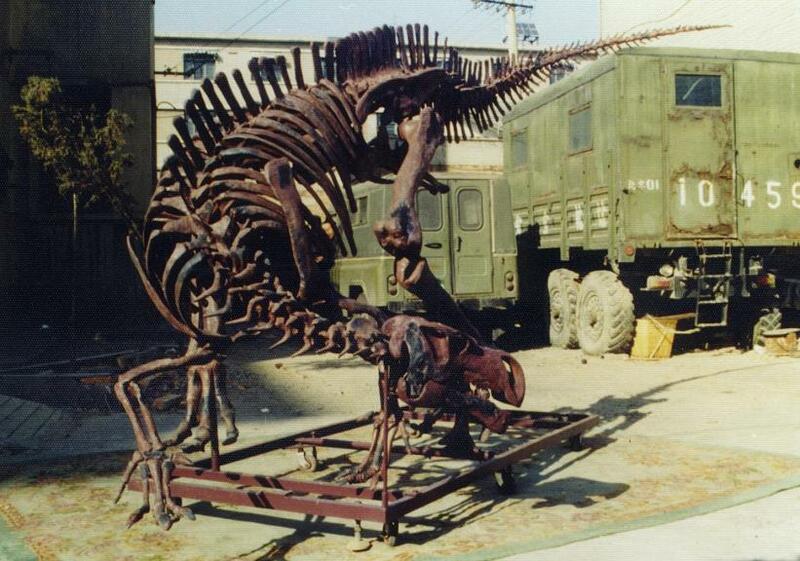 This one of a kind Stegosaurus skeleton is available for sale. 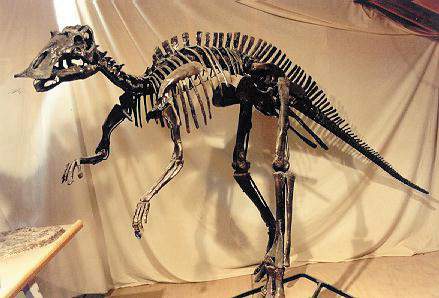 Now is your chance to own a cast of this awe-inspiring Dinosaur! We're nice people and are happy to give you any information you'd like with no pressure to purchase anything. Sure to be a crowd pleaser or the envy of all your friends. Sarah the Stegosaurus skull cast. 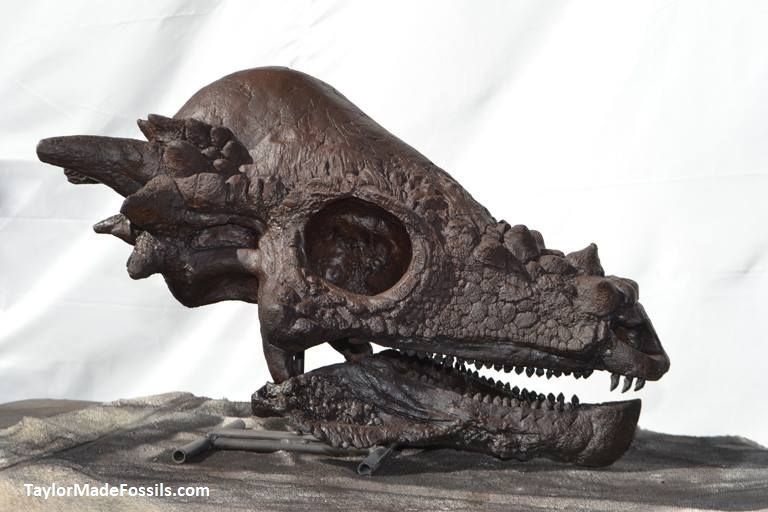 $1,250 the most complete Stegosaurus armatus skull ever found! 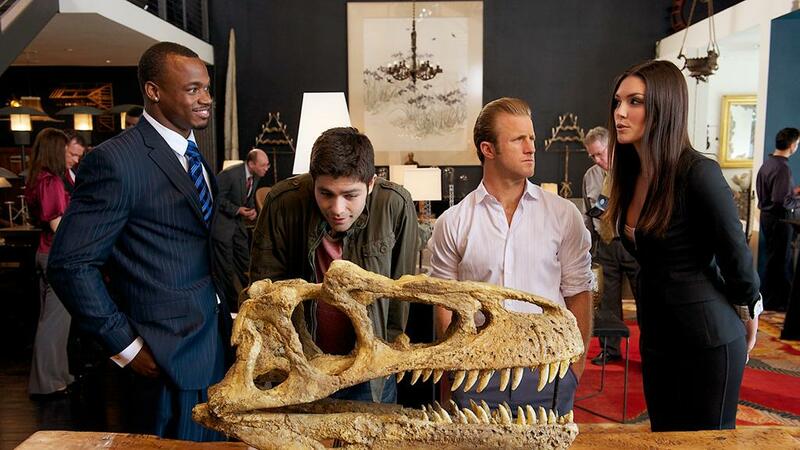 A cast replica made from Sarah's skeleton is also available for $65,000 for mounted skeleton. This amazing dinosaur cast measures 9' l (2.75m l). 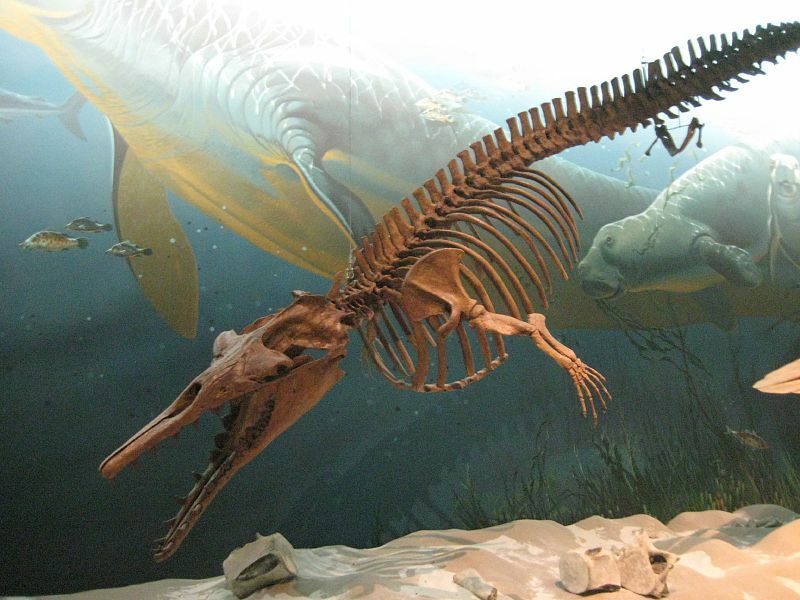 The original fossils were discovered in Harding County, South Dakota. Shipping for this item can not be calculated in shopping cart. Struthiomimus Translation: Ostrich Mimic. Struthiomimus (strooth-ee-oh-MIME-us) was a long-legged, ostrich-like dinosaur of the family Ornithomimidae, which lived in the area that is now Alberta, Canada. Its generic name is derived from a Greek word meaning "ostrich" and also a word meaning "mimic" or "imitator". The specific name altus is from Latin, meaning "lofty" or "noble". This Delicate and fascinating specimen is made entirely of resin and was found near Glendive, MT. It weighs a mere 1lb. and measures 12"x4"x6". Struthiomimus (meaning "ostrich mimic", from the Greek strouthion meaning "ostrich" and mimos meaning "mimic" or "imitator") is a genus of ornithomimid dinosaur from the late Cretaceous of Alberta, Canada. It was a long-legged, ostrich-like dinosaur. The bipedal Struthiomimus stood about 14 ft long (4.3 meters) and 4.6 ft (1.4 meters) tall at the hips and weighed around 330 lb (150 kilograms). 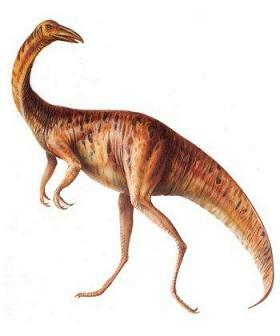 Struthiomimus is one of the more common small dinosaurs in the Dinosaur Provincial Park; its abundance suggests that it was a herbivore or omivore rather than a carnivore. 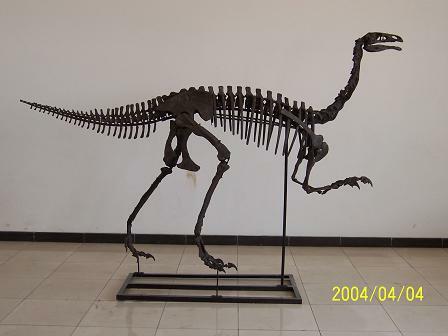 Struthiomimus altus skeleton cast (mounted or in situ) in additon to individual skeletal elements are also available. Please ask. Stygimoloch (meaning "horned devil from the river of death") is a genus of pachycephalosaurid dinosaur from the Cretaceous. Stygimoloch is currently known from the Hell Creek Formation and Lance Formation of the Western Interior (United States), where it lived alongside Tyrannosaurus and Triceratops. The type species is Stygimoloch spinifer. 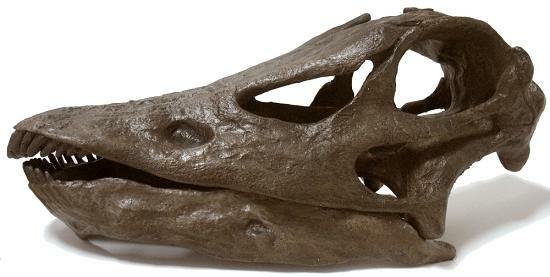 Stygi Partial Skull cast measures 17" long, 15" wide and 5" high. Cast weighs 7 lbs. 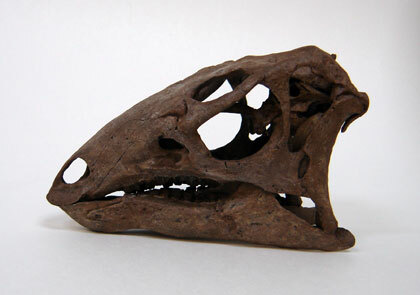 We also have a Pachycephalosaurus wyomingensis / Stygimoloch complete skull and skeleton available. Please call or email us for price and pictures. 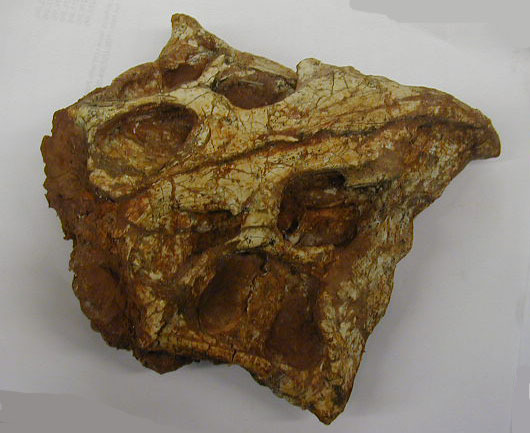 Supersaurus scapula fossil cast. 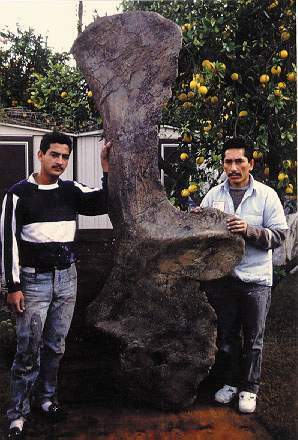 This is one of the biggest fossil casts you will ever see (if not the biggest). This single vertebra measures a whopping 8ft! (2.5m). Type Specimen. Dry Mesa Upper Jurassic Sauropod. Molded from original BYU specimen. Supersaurus (meaning "super lizard") is a genus of diplodocid sauropod dinosaur discovered in the Upper Jurassic Morrison Formation of Colorado in 1972. It is among the largest dinosaurs known, possibly reaching 33 to 34 meters (108 to 112 ft) in length. This cast measures 8 feet long x 3 feet wide. Shipping and crating are not included. $500.00 (Skull with stand $575). 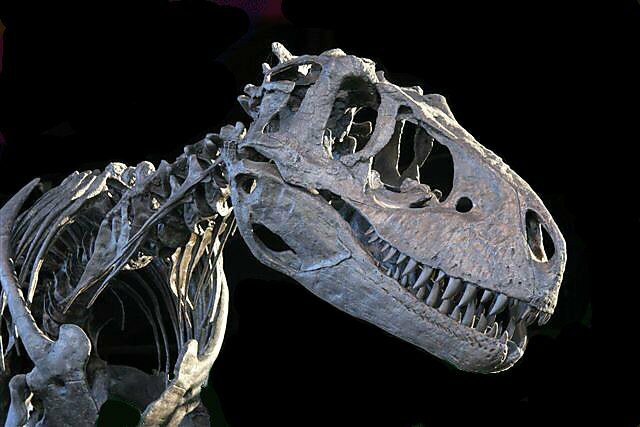 Tarbosaurus (pronounced TAHR-bow-SAWR-us; meaning "terrifying lizard") is a genus of tyrannosaurid theropod dinosaur that flourished in Asia. 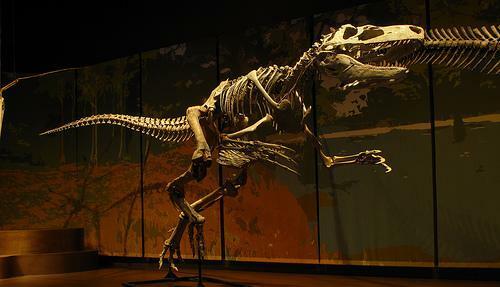 This Tarbosaurus Battaar skeleton cast was molded from original fossils. 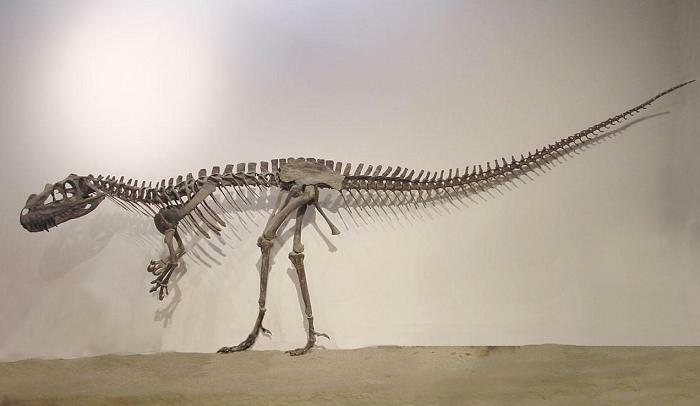 A great cast of a Tyrannossaurid skeleton. A beautiful example of this great dinosaur. Please note that color of all casts may vary. Tarbosaurus the T.rex from Asia. This skull cast measures 44 inches long, 29 inches high, and 24 inches wide. $4,000 plus crating and shipping. Please note that shipping for this item can not be calculated in the shopping cart. You will be invoiced for shipping cost. Please call (314) 556-0650 or email us for more photos, information, or shipping cost. 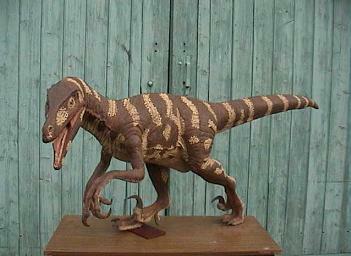 Thescelosaurus neglectus Skeleton cast replica. 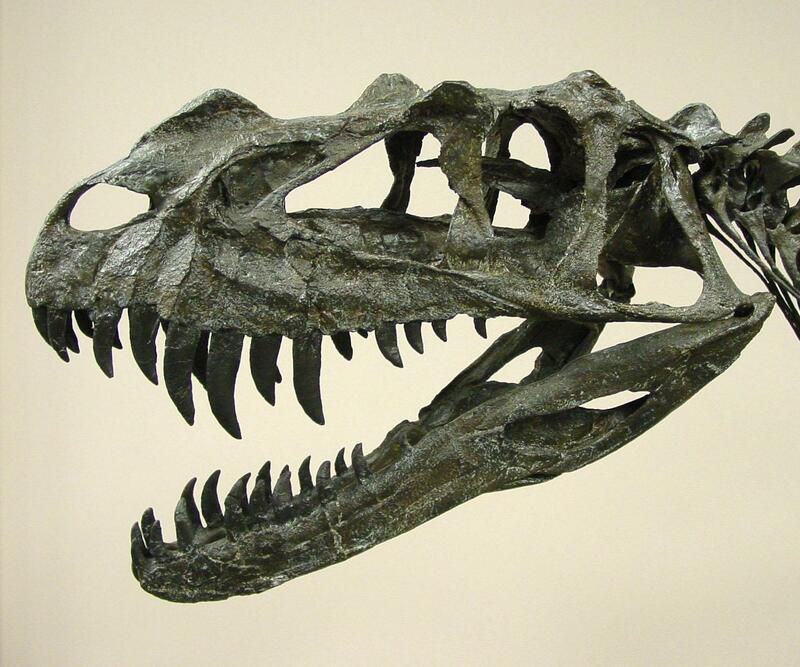 This dinosaur cast was molded from original fossils discovered in Harding County, South Dakota. This is one of the rather uncommon inhabitants of the late Cretaceous Hell Creek formation. An omnivore, it had a stout body and no visible means of defense. Titanichthys agassizi was a giant, aberrant marine placoderm from the Late Devonian. It approached Dunkleosteus in size and build. 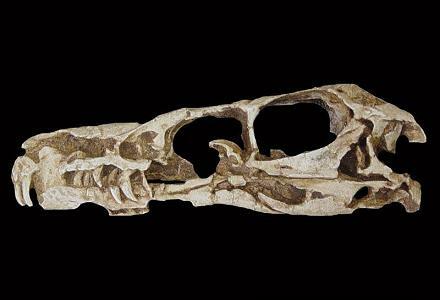 Unlike its relative, however, T. agassizi had small, ineffective-looking mouth-plates that lacked a sharp cutting edge. It is presumed that the beast used its capacious mouth to swallow or inhale schools of small, anchovy-like fish, or possibly krill-like zooplankton, and that the mouth-plates retained the prey while allowing the water to escape as it closed its mouth. When the first specimens were found in Morocco by geologist Henri Termier, Titanichthys was originally placed within the genus Gorgonichthys - that is, after Termier was able to convince his colleagues that the bone scraps were of a placoderm, and not a A junior synonym is Brontichthys, which should not be confused with another arthrodire, Bruntonicthys (Dinichthyidae). Please contact us for pictures. 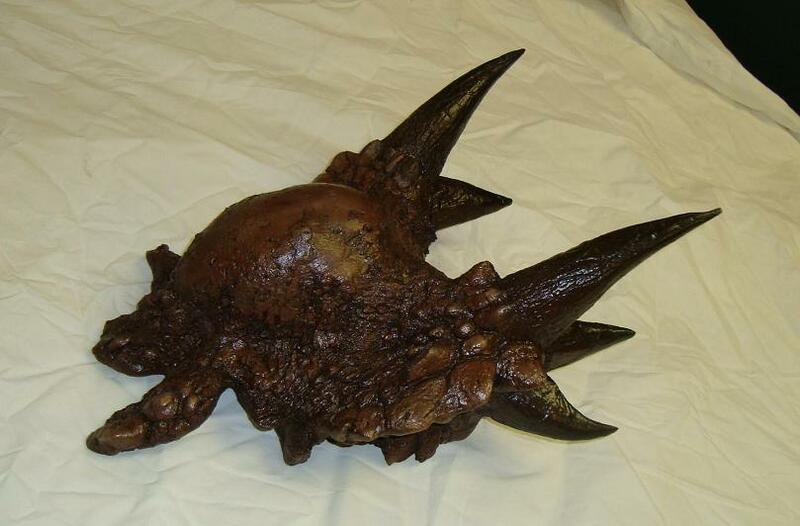 Molded from one of the finest Triceratops fossil skulls ever found. This skull cast measures 6 ft long by 5 foot wide by 4 foot high (not including the height of the stand). $8,400 (this includes the crating but not the shipping). $8,500 (plus crating and shipping). 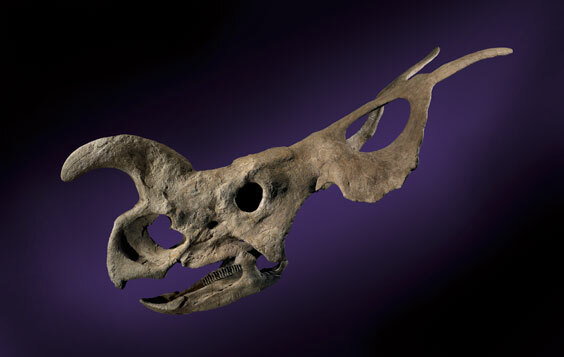 Triceratops skull. This is a real fossil not a replica. 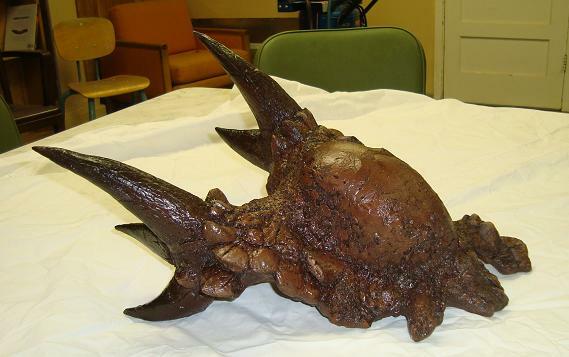 Full size adult Triceratops skull. Measures over 7 feet in length. $149,000. I will gladly send more pictures if needed. 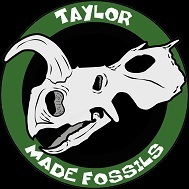 Please email us at: taylormadefossils@yahoo.com or call (314) 556-0650 for more details. 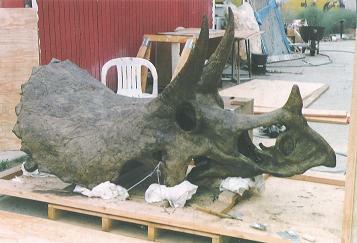 Triceratops skull (and/or) skeleton. 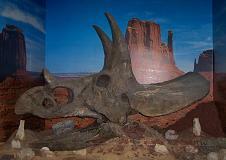 We have several skulls and skeletons of Triceratops for sale. We will beat any price! Please inquire. You can purchase the skull alone or with a skeleton. Triceratops Skull plaque cast: $1,500 (plus $300 US shipping). For shipping cost outside the US please contact us. 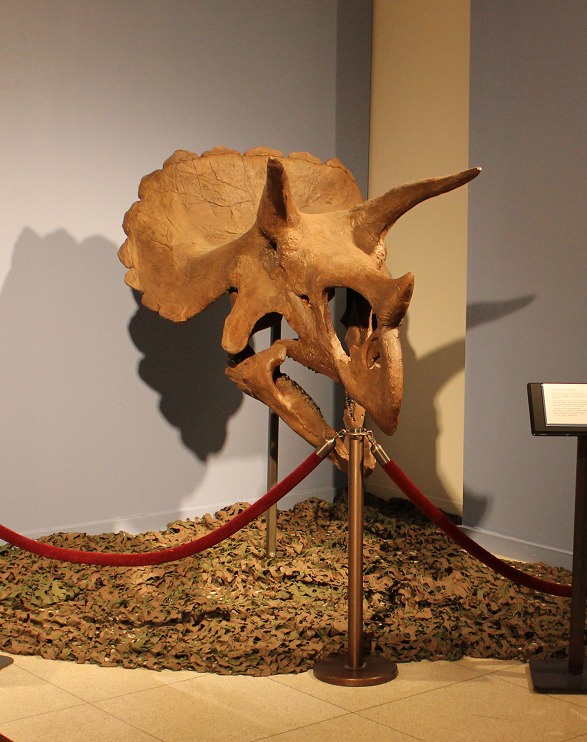 This Triceratops skull has been mounted in a 3D profile view much like it might have appeared in death. This type of mount allows it to be hung on a wall. 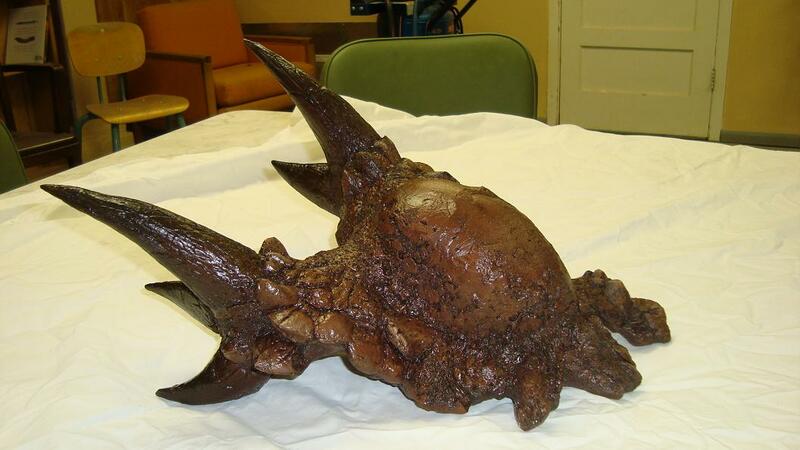 If space is an issue in your museum or collection this is a great way to finally own your own Triceratops skull. The panel is made of resin and fiberglass. It is 72 inches long, inches 42 wide and 12 inches in relief. Please email us for more photos or information. 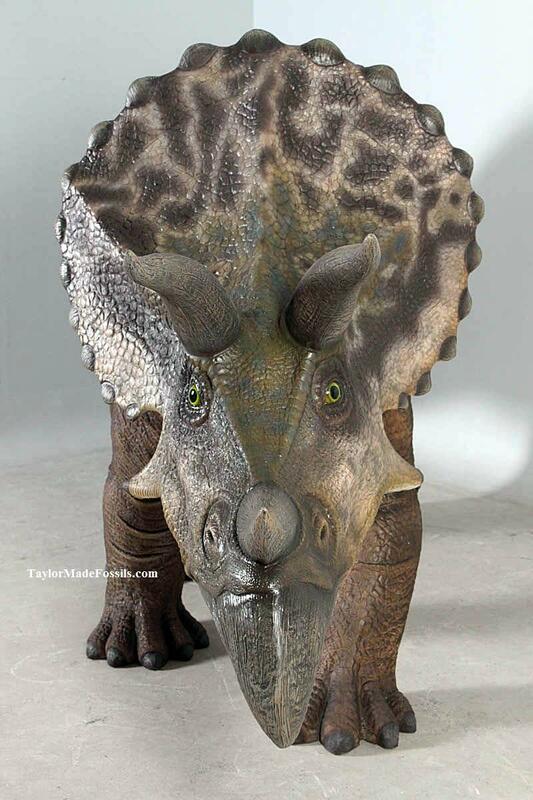 This fiberglass dinosaur statue is now available. Custom painted - you choose the colors. Statues are finished with a protective topcoat suitable for outdoor use. Price is $4,995 plus shipping. We will gladly discount multiple items. More lifesize dinosaur sculptures here. In 2006 near Jordan, Montana, a triceratops quarry was discovered. 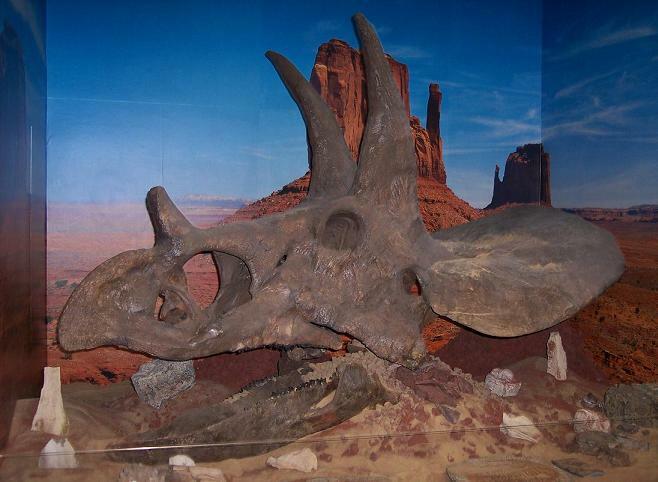 The quarry contained a sub-adult triceratops partial skull and skeleton, and elements from a baby triceratops. The first two elements from the baby that were found were the left humerus and the right dentary. The humerus (6.25" long) was complete and dentary was 50% complete. As preparation continued on the sub-adult material, the left dentary was discovered! This one was complete, allowing for the length of the dentary to be known (5.25 inches)! With the left one found complete, the right one could be reconstructed. Now, these very rare and unique replicas are available. Each dentary has a tooth in it. This is truly a unique set of replicas. With these elements, it can be estimated how big the triceratops was. 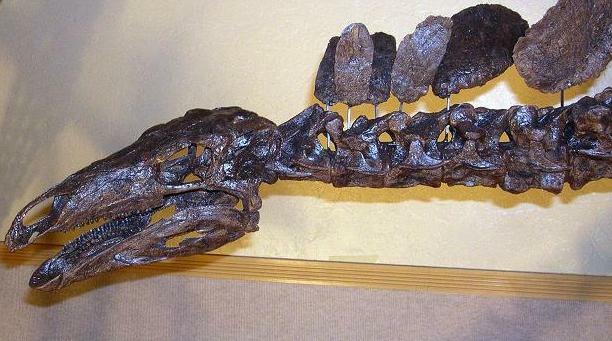 It is guessed to be under 3 feet long, with a skull less than 12 inches! They were found near Jordan, Montana and in the world famous Hell Creek Formation. This formation is upper cretaceous. 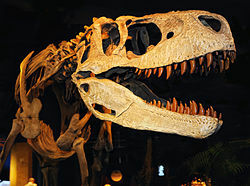 The first Tyrannosaurus rex was collected within 100 miles of the site by Barnum brown over 100 years ago. 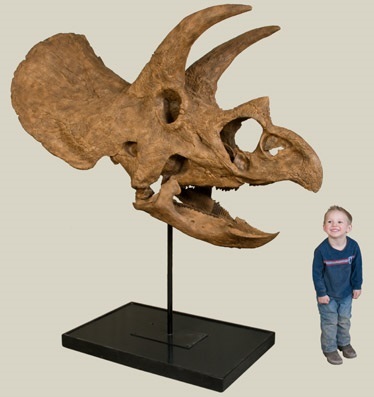 This baby Triceratops supraorbital (above the eye) horn replica is the smallest known horn from a Triceratops that has been identified to date. 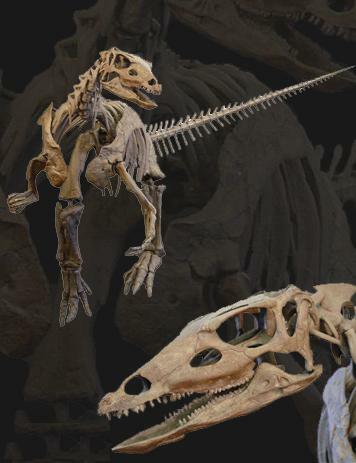 This is a wonderful replica to display all by itself, or obtain it for size comparisons between adult, juvenile, and baby. Discovered in the Hell Creek Formation, Harding County, South Dakota. This ships with an I.D. label, or you can choose the mounted version - on an attractive acrylic base with label. Like antlers and horns on modern day mammals, Triceratops horns were probably used more for show (and thus mate selection) than for defense. But if you would rather forget we said that and instead reminisce on the more romantic "T. rex versus Triceratops" concept, we'll understand. And its important to remember that much speculation goes into recreating the life of dinosaurs so Triceratops may have indeed defended itself with those massive, reinforced horns. 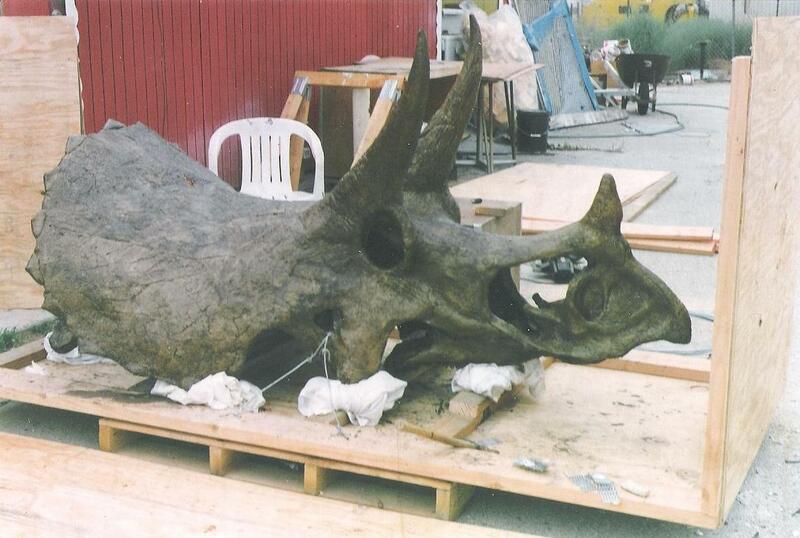 Triceratops of course had three horns, two on it's brow and another smaller horn behind it's snout. When you hold these giant bones in your hands, consider that only the inner cores are preserved as fossils. In life, these structures would have been sheathed in a hard, shiny horn. Truly this was an awesome tool for one incredible dinosaur. 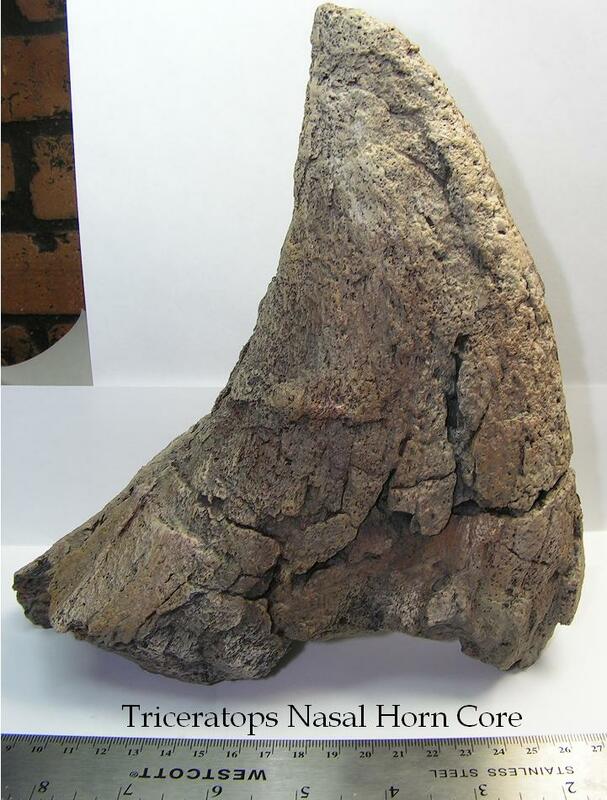 Triceratops horns cast replica - Double horns! Triceratopps long double brow horns. 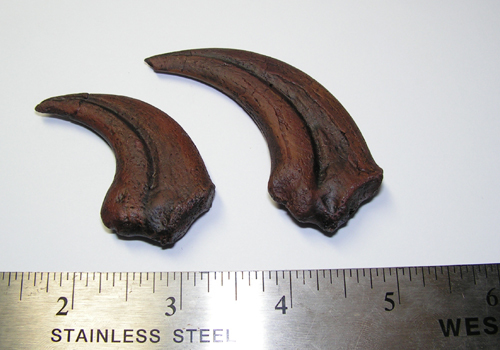 This pair of triceratops horns come from the quadruped plant-eater of the late Cretaceous of North America. Horns measure 22" long and 13.5" in between the two tips. 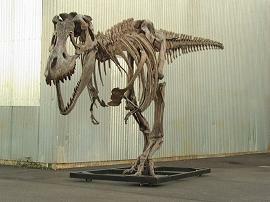 Now available for sale Ivan the T-rex skeleton cast replica. This skeleton measures 40 ft long by 12 ft high at the hip. 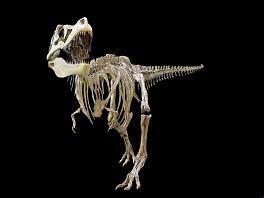 Complete T.rex skeleton cast: Unassembled skeleton also available - please inquire. Production time for this skeleton varies. Please contact us. Custom mounted to your specifications. 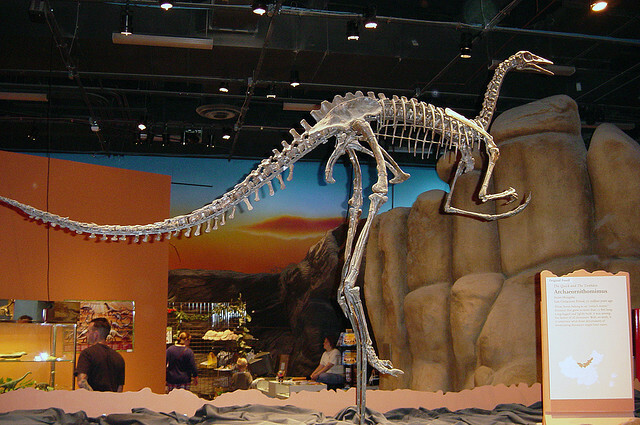 This skeleton was molded from the original skeleton now on display at The Museum of World Treasures in Wichita, Kansas, United States. 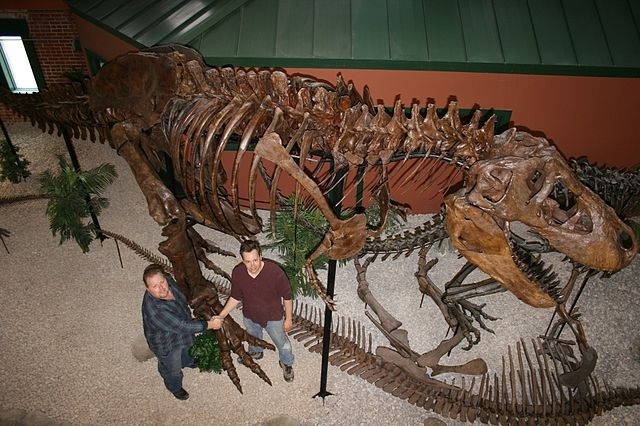 Ivan the T. rex was discovered by Alan Komrosky in 2007. 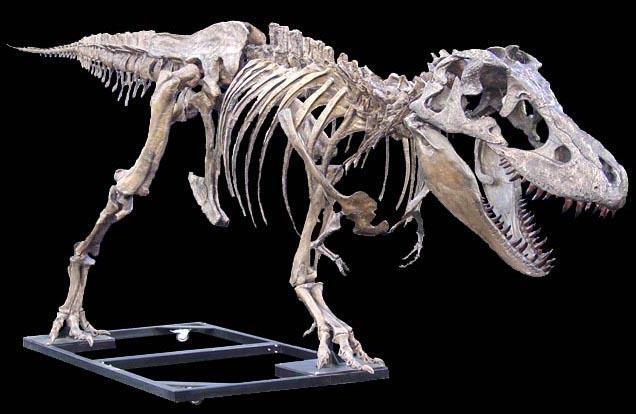 An amazing 65% of this giant Tyrannosaurus Rex was recovered. 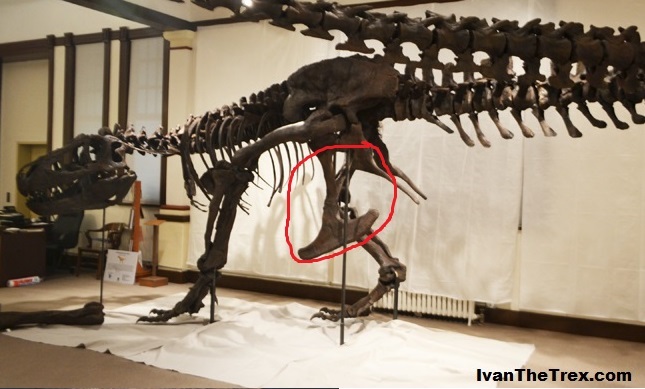 When it was found, Ivan had the most complete tail of any T. rex, with only three vertebrae missing. This skeleton is available for rent! Please call (314) 556-0650 or email us for more information or photos. 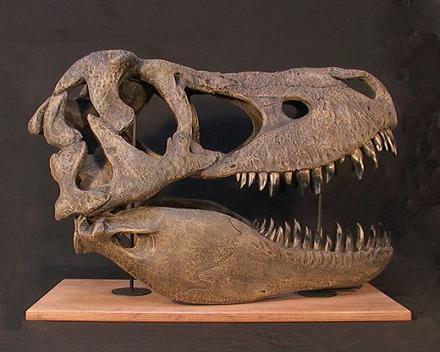 Here is one of the most famous T.rex skulls of all time. 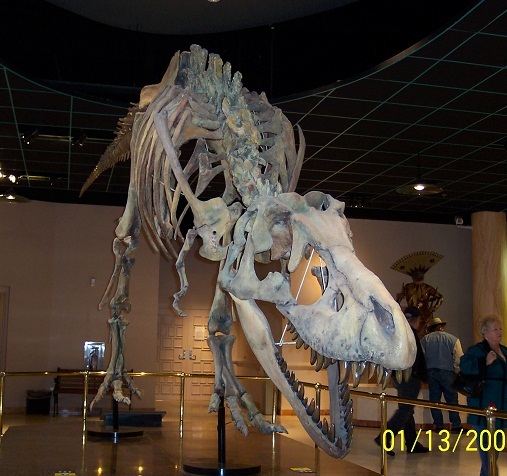 This specimen nicknamed "Stan", in honor of amateur paleontologist Stan Sacrison, was found in the Hell Creek Formation near Buffalo, South Dakota, in the spring of 1987. After 30,000 hours of digging and preparing, a 65% complete skeleton emerged. This tyrannosaur was found to have many bone pathologies, including broken and healed ribs, a broken (and healed) neck and a spectacular hole in the back of its head, about the size of a front lower Tyrannosaurus tooth. 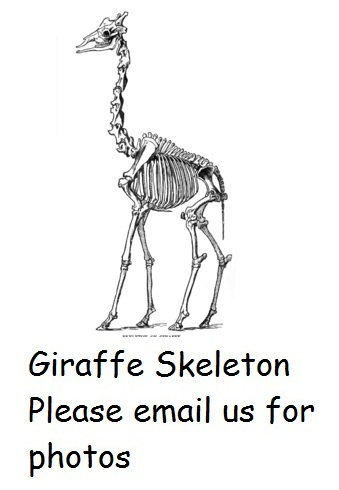 Please inquire about other specimens. 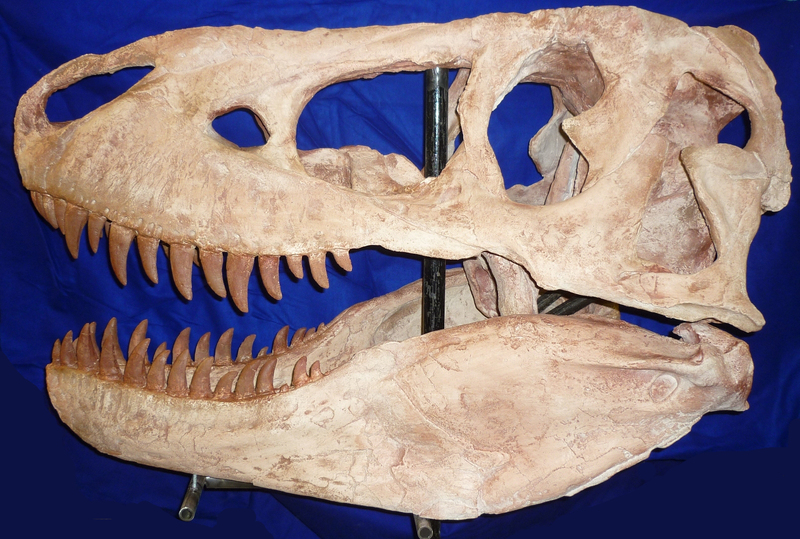 We have several Full size T.rex skeletons available. Please contact us for pictures and prices. 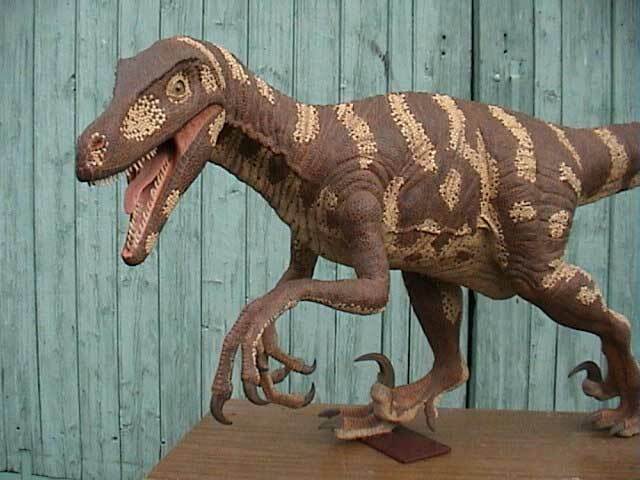 This cast replica comes from the Cretaceous Hell Creek formation, Jordan, Montana. The original is an Los Angeles County Museum of Natural History specimen. Life size (1:1 scale) complete skull with mandible included. 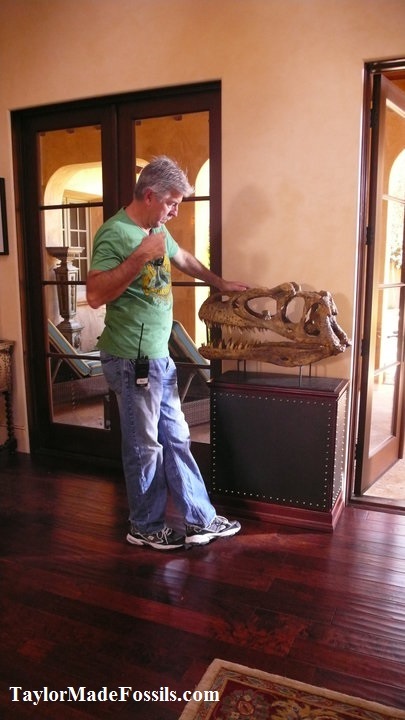 You won't find a better price on a cast replica T-rex skull anywhere. We will match anyone's price. Various stands available. $3,200 plus $300 US shipping (please contact us for shipping outside the US). The quality and detail of this sculpture is superb. While not as scientifically accurate as a cast, the quality and attention to detail is wonderfully executed. In addition to it's impressive appearance as an exhibit (or the ultimate conversation piece), this skull makes an excellent educational tool. A different resin is used for outdoor use and is an additional $60. This foot measures 46 in. tall. The widest part of the foot measures 21 inches across (from the tip of the first toe to the tip of the 3rd toe. The length of the longest toe (the middle) is 23 inches. There is a $50 charge for a large box or wood shipping crate. Shipping is not included. On average shipping cost is between $100-200. Please contact us for exact shipping cost. 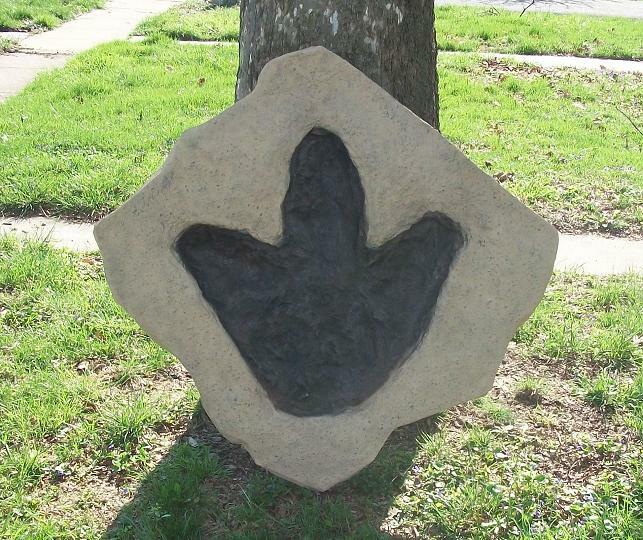 "My students LOVE the T-rex footprint that I purchased from Taylor Made Fossils!" "The T-rex print is just great!!!!!" 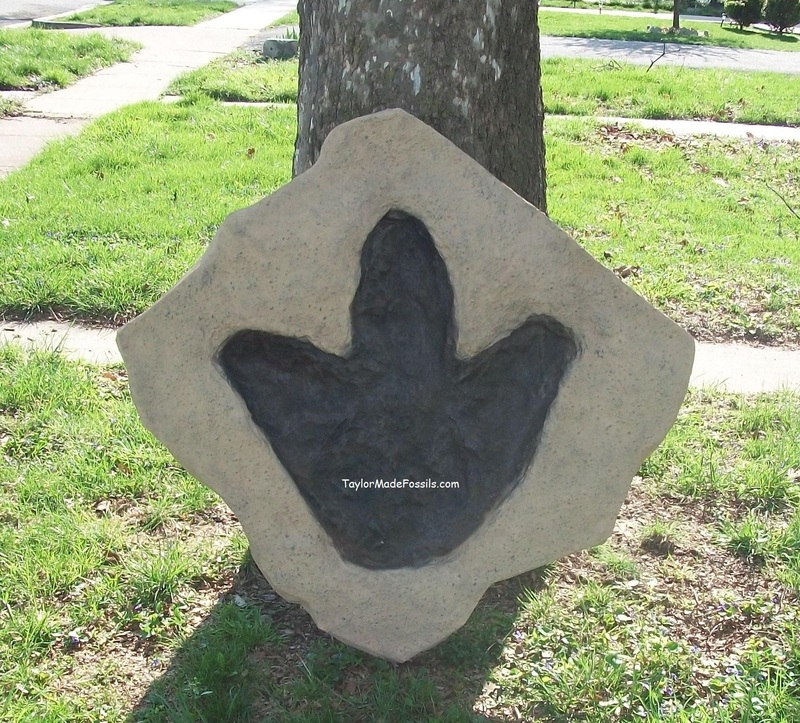 Another great example of a T.rex (T-rex, Tyrannosaurus rex) footprint cast replica. This T.rex footprint measures 33x34 inches, and the entire cast measures 48x48"
There is a $50 charge for a wood shipping crate. Shipping is not included. On average shipping cost is between $100-200. Please contact us for exact shipping cost. A pubis of Ivan the T-rex. 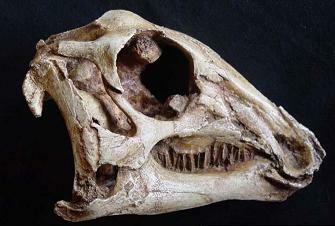 This is an impression from the skull cavity of this Carnosaur of the late Cretaceous of North America. 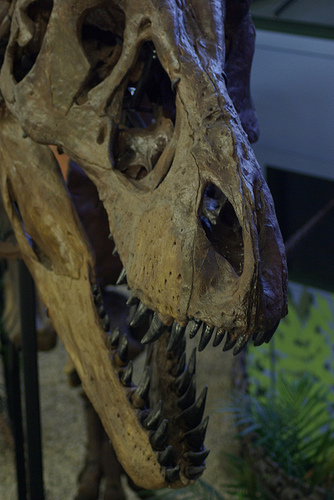 the T.rex brain shows evidence of a keen sense of smell. sight and hearing. All aspects of a highly developed predator. This reconstruction, showing Tyrannosaurus rex tooth progression, provides a fascinating look inside the tooth regeneration process of the most fierce predator North America has ever hosted. The exterior of the dentary is intact, while the interior provides an open window to the innermost actions taking place. The Theropod dinosaurs regrew their teeth as the old ones became too worn or broke off. The blood vessels and soft tissues would have transported the raw materials necessary for healthy teeth and bone as these massive giants continually regenerated their fearsome smile and devastating bite." Uintatherium Skeleton Rare and exotic dinocerta mammal of Eocene Uinta Colorado. Gunma MNH (Japan). 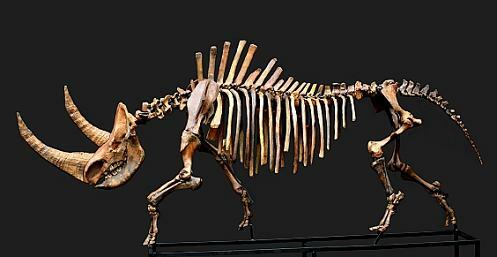 Uintatherium mounted skeleton measures: 114in (2.89 m) length. Uintatherium is an extinct genus of mammals. 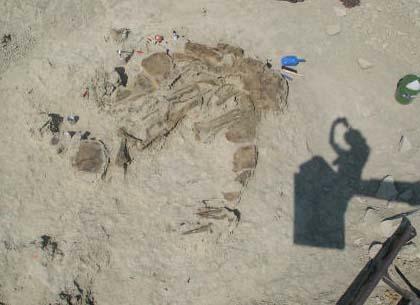 Fossil remains were discovered near Fort Bridger, Wyoming. This was a large browsing animal, about the size of a rhinoceros. What was most unusual about Uintatherium was its skull which was large and strongly built. Uintatherium had a flat, concave skull a feature not found in any other mammal, save, perhaps in some brontotheres. Its cranial capacity was exceptionally small due the walls of the cranium being tremendously thick. The weight of the skull was mitigated by numerous sinuses permeating the walls of the cranium, like those in an elephant's skull. 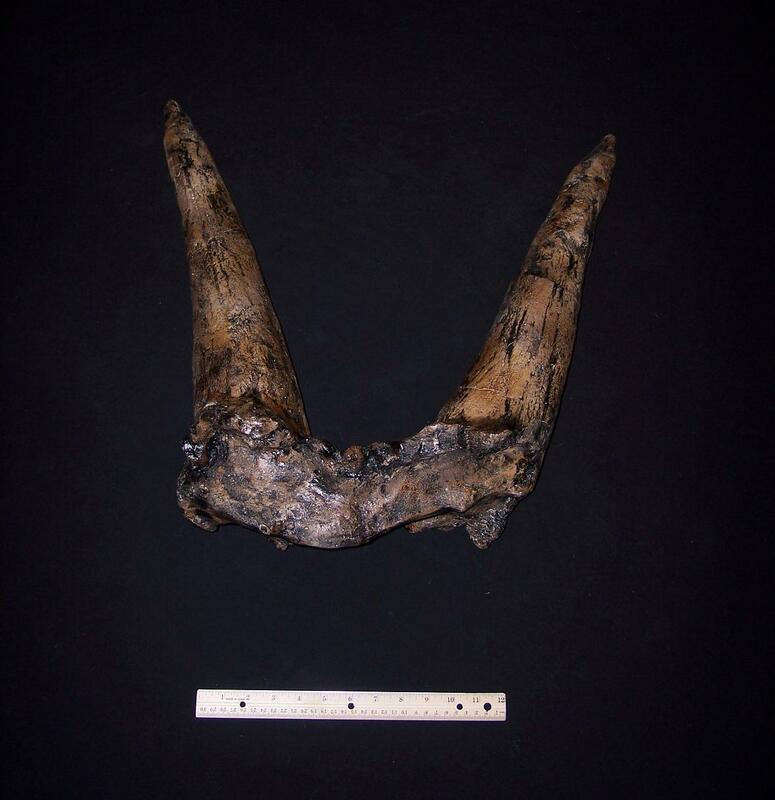 The large upper canines were apparently formidable defensive weapons and were larger in males than in females. The skulls of the males bore six prominent knob-like ossicones (horn-like or antler-like protuberance) which grew from the frontal region of the skull. The function of these structures is unknown. They may have been of used for defense or display. 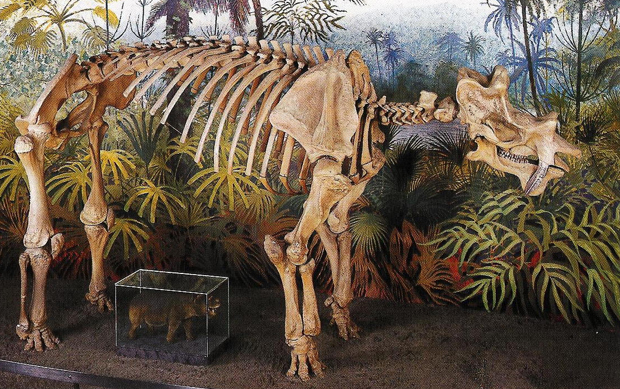 Uintatherium lived during the early to middle portions of the Eocene. It was an herbivore, eating leaves, grasses and shrubs. Uintatherium lived near water and used its sabre-like canines to pluck the aquatic and marsh plants which comprised its diet. 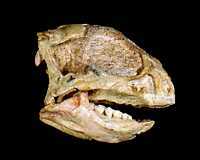 It became extinct by climatic changes and competition with brontotheres, and true and hyrachodont rhinocerii without leaving any descendants. Mammal amblypod of the Eocene Uinta Formation of Colorado. Please email us for more information or photos. 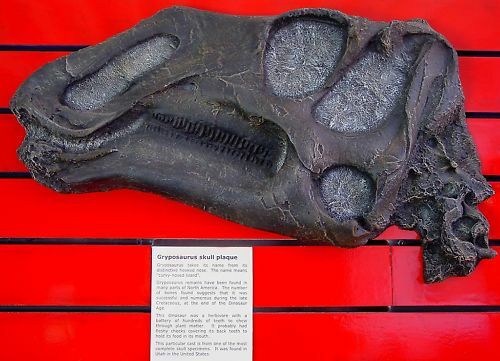 Velociraptor Skull cast from original skull. 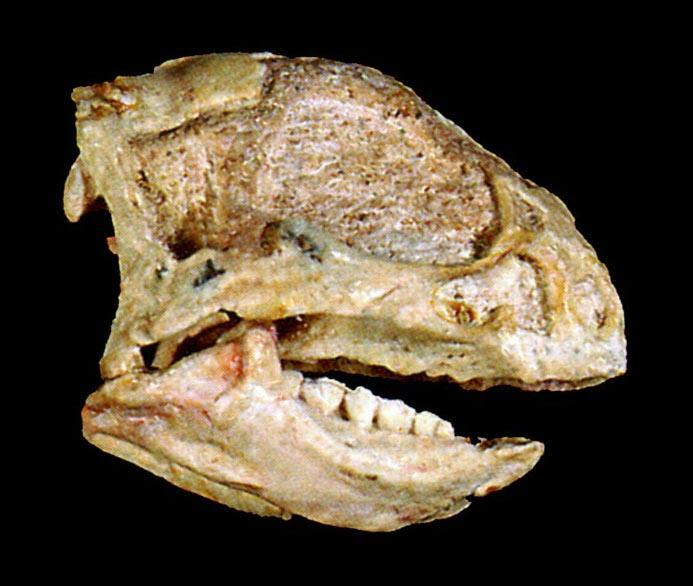 Discovered in Mongolia in the Djochta formation. Meaning of Name: "swift robber" / "Speedy predator"
Meaning of Name: "Speedy predator"
Late Cretaceous (Campanian), Djadokhta Formation. Measurements: 5' 9" long. Height varies by pose (approx 24" in standing/running pose). Molded from a private specimen. NOW $3,500 (plus shipping) That is THOUSANDS less than our competitors! This is an as yet unnamed species of intermediate whale from the late Oligocene. It was discovered in South Carolina by Steve Faust. The skull is 6' in length, the complete skeleton is 22' in length. 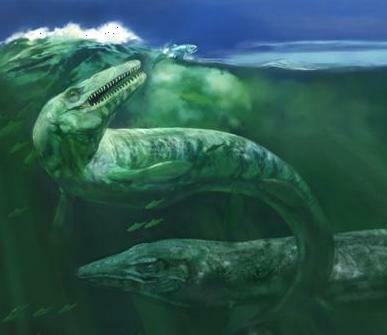 Zygorhiza was a smaller, less elongated, 6 m (20 foot) long relative of the famous Basilosaurus. Zygorhiza had flippers which could, unlike in modern cetaceans, be moved at the elbow. Its hind limbs were rudimentary. Zygorhiza's one-metre (3-foot) skull had fearsome jaws with deadly teeth. Unlike modern cetaceans, Zygorhiza had a neck consisting of seven vertebrae. We give a percentage of our sales to various charities. Please help us support the causes we believe in.